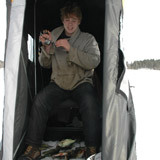 Ice Fishing Report February 28, 2011 Jeff Sundin Leech Lake Area lakes. Sunday wasn't exactly balmy, but after a cold start to the morning, the west winds did deliver on the promise of bringing us a slight warming trend. Not a moment too soon either because we had a special plan for closing out the final day of inland Pike, Walleye and Bass fishing. In this case, having teenagers in tow worked to my advantage because by the time everyone was up and rolling, the day had been given a chance to warm up. We arrived at the ramp around 1:00 PM and the sun had come out, warming the air temperature to around 20 degrees. I arrived just after Don and he already had his boat in the water at the ramp. We managed to get both boats into water and trucks parked without any problems. Don was in first, so he had a little head start and by the time we were rigged and fishing, I'd already seen him catch two Bass. We were getting excited as we made our way up the bank and got into prime fish catching territory, but just when we thought it would get good, things just sort of fizzled out. Not that we didn't have a little excitement though, Austin caught a couple of Bass and a Dogfish and Annalee and I both had chances to hook fish, but missed them. The best part was seeing everything along the river starting to come back to life. We saw several Eagles, one flock of swans, a flock of ducks and a couple of deer. Beside that, it was a great excuse to get the boat out onto the water. So now I just can't figure out...was that the last day of ice fishing or the first day of open water fishing? Carl Bergquist is the best friend anyone could ever ask for. But once a year, we have to prove our loyalty by eating a piece of Lutefisk. 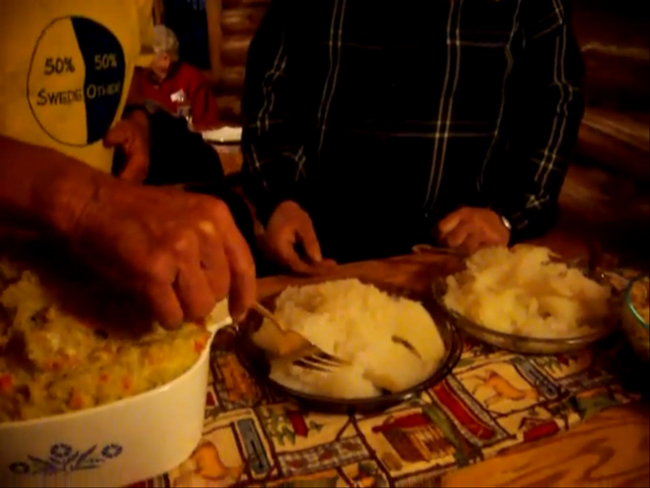 I have to admit that it gets a little easier each year, but I still need to have fun with it, so here's the full report including This Special Lutefisk Video taped live at the 2011 Sand Lake Lutefisk Club annual event. Right: Lutefisk served hot from the secret, basement cauldron. What is Lutefisk? it's a white fish, generally Cod that's preserved by dehydrating and then re-hydrating using a series of water soaking treatments including a nice two day bath in Lye solution. After soaking it in the Lye, it's returned to clean water for another four or five days of soaking. View Larger Image. Eventually, it's ready to cook in Carl's secret cauldron, hidden in a secret room of the basement. Finally, it's served with a nice white sauce and all kinds of yummy side dishes. If not for Carl, I would never have eaten my first piece, but after eating it for ten years or more now, I can honestly say, it won't kill ya! Hey! We saved you a piece, don't worry about how long it takes to come get it, it lasts forever. More ways to connect! Sign up to receive the Free "Insider Newsletter". Don't forget, you can always catch up with Jeff Sundin on the radio program too! Listen every Thursday at 6:20 AM and get additional fishing reports and information. KAXE 91.7 FM Grand Rapids - 105.3 FM Bemidji - 89.9 FM Brainerd . Want even more? Get HANDS ON Fishing Tips. Book your own Guided Fishing Trip ! 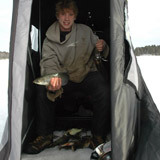 Ice Fishing Report February 27, 2011 Jeff Sundin Leech Lake Area lakes. One last day of Walleye, Pike and Bass fishing for Minnesota's inland waters! For Deer River area anglers a southwest breeze will be delivering temperatures in the mid-20's so there's no reason not to give it one last whirl today. Unless the weather messes things up, I have a special plan up my sleeve for wrapping up the season, I'll save the details about that for tomorrows report. On Saturday, Leech Lake Perch fishing made the news again. Anglers heading out from the landing at Pine Point were pleasantly surprised when Perch that had been providing only sluggish action recently, staged a rally. Interviewing anglers as they came off the lake, the DNR Creel Survey Staff reported that most everyone coming off of the lake had caught fish. In fact, many anglers were reporting catching limits of Perch. On Lake Winnie, the Perch action is holding up too. The best reports are still coming from anglers fishing in deeper water. According to a group of fishermen coming off of the lake, they had good fishing on the deeper, outside edges of bars and humps on the main lake, out from Raven's Point. Another group had done well fishing in 24 to 28 feet on the main lake in the Stony Point region. Yesterday I mentioned Bluegills moving toward the weed edges, but today I have a report of deep water Bluegills coming in from another area on the same lake. A friend was fishing in 32 feet of water using small ice jigs tipped with a couple of Euraolarvae. There was a mixed bag of everything under the sun out there. He caught Bluegills, Perch, Northern Pike, Rock Bass and even a Walleye. A hatch of insects in the soft bottom was holding the fish in the area, so if you have a spot or two like this in your repertoire, now might be a good time to check it out. 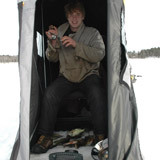 Ice Fishing Report February 26, 2011 Jeff Sundin Leech Lake Area lakes. I guess as long as the calendar still says that it's February, we can live with cold temperatures, but sheesh...it's -18 degrees right now! This is good news for the on-ice transportation department though. Ice conditions and roads continue to improve and getting around on most lakes is easy. The only problem areas to watch are the places where deeply drifted snow never fully melted down during last weeks warm spell. When you see areas of hard packed snow on the lake, go around or at least drive on the places where snow depth is the least. I've only heard of a few places where anglers are getting stuck, but there are still a few trouble spots out there. As much as I'd like to have a long, glorius report today, I'm afraid that the news hasn't changed a lot. You'll probably get more information by reading the posts from the past 4 or 5 days. One bit of new news that came my way on Friday was a hint about some great Bluegill fishing that's developing right now. A group of visitors to the area did a bang up job on the 'gills over the past few days by fishing just outside the weed edges adjacent to a deep breakline. 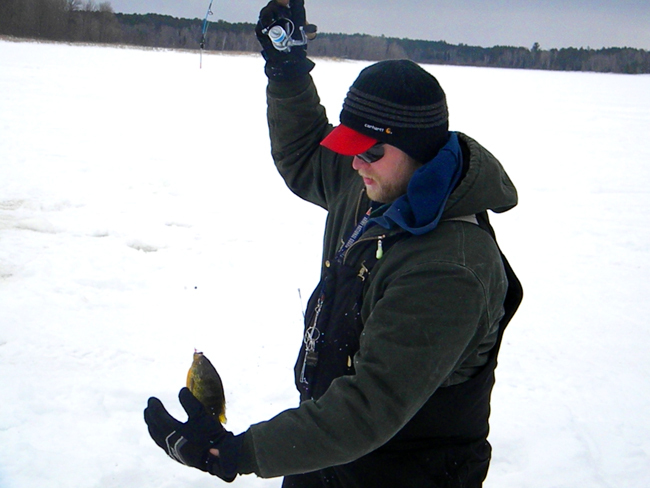 The Bluegills were hitting on small ice jigs tipped with waxworms. This is really good news because this is a common trend during late ice and it means that your favorite Sunfish lakes are getting ready to start popping. In late winter, Bluegills can act a lot like Walleyes in that they'll bite really well during low light and then lay back durning mid-day. Don't get discouraged if the action is slow at noon, especially if you're spotting fish. What I do is move from one hole to another with my Humminbird and keep track of with holes I catch or spot the most fish in. When the sun starts moving lower in the afternoon, I'll make sure that I'm sitting at one or two of the spots where I saw the most fish. It's very common for the sunnies to get active before the Crappies, so if Crappies are present, sometimes you'll get a mixed bag. Great sunfish spots will have access to deep water with a soft bottom located near large weed flats. Drill some holes out deep, some on the breakline and a few right in the weeds. In the past, we've caught sunfish as shallow a 3 or 4 feet of water during late ice. (2-26) Today's great excuse to get the kids out on the lake! 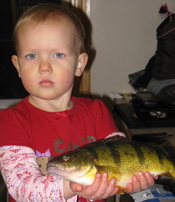 Perch Fishing on Winnie, The Kids Perch Jerk sponsorred by the Leech Lake Tribal Council is this Saturday Feb. 26, 2011, from 10 AM to 2 PM. Headquarters for the event is out of Denny's Resort in Bena. The contest features trophies for the fishing contest plus raffle prizes and games foir all entrants. 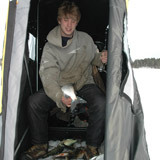 Ice Fishing Report February 25, 2011 Jeff Sundin Leech Lake Area lakes. For the second time this month, we've managed to dodge the big storm and now we're set up for a great weekend of ice fishing. A dusting of snow fell in the area on Wednesday, but not enough to cause concern for anyone heading this way for the last weekend of the Walleye and Pike season. In fact, you couldn't write a better script for the up-coming weather, cold enough at night to keep the ice in good condition, but not the kind of deep-freeze that makes you want to stay off the lake during the daytime. 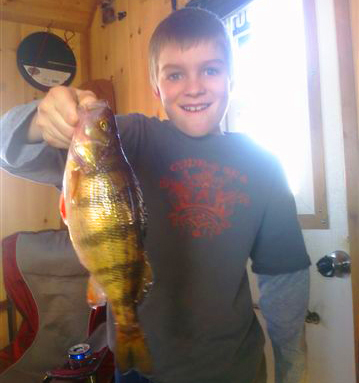 Deer River area fishing reports are getting to be focused more on Perch now than they have been all winter. I checked in with my pal Bill Powell over at Fred's Bait on Thursday and he told me that lots of groups are coming back with glowing reports after their trips out on Winnibigoshish. In fact he said that a lot of these anglers are reporting limits of Perch and then coming in looking for advice on where to go next for panfish or Pike. I took a drive up to the north side of Winnie on Thursday afternoon hoping to find a new spot or two where we could get on the lake from Bowens Flats. So far no one has attempted to punch through the snow at any of the campers landings along the road. 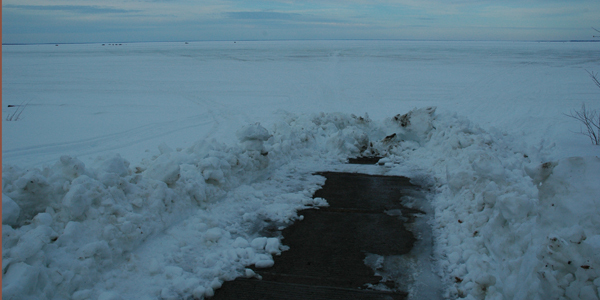 For now, access to the lake by truck is still limited to the landings that have been plowed earlier this winter. Once you're on the lake though, you can go most anywhere you want. If you bring an ATV, you could easily get out accross the top of the hard crusted snow. It was fairly easy for me to walk accross it, but I still broke through in some areas. From the high ground at Bowen Lodge, I could easily see out accross the lake and spotted several areas where anglers were hustling around. Fishing deep water, there's a lot of activity out in the area southeast of the Perch Bar, near (or on) some of the humps and bars out from Highbanks. There's even more activity on the bars and humps in the northwest corner near Third River and there's still a ton of folks fishing in the southwest corner north of Richards townsite. In shallower water, there are groups of anglers fishing along the edges of the large flat at Tamarack Point. (2-25) A quick report from Leech Lake. At Horsehoe Bay Lodge. "The fish are picking up right now, after the cold fronts. Walleyes, perch, whitefish, northerns out on the main lake structure. The closest best producer a hump in 18' of water." The southwest side of the lake has re-frozen nicely now and travel on the lake has improved. There's still some snow cover, so ATV's and snowmobiles are proably best, but careful driving will get you around in a 4 X 4 as well. Horsehoe Bay is running a special on their poolside rooms through April. You can get $99/night (max 4) for 2 queen beds. Leech Lake's Accorn Hill Resort, Rich dropped a note saying the fishing action has picked up and travel conditions are greatly improved since the re-freeze. (2-25) On Lake of the Woods, Eric from Border View Lodge says that they've made a move with their deep mud houses and brought them back closer to Pine Island. Now located in 26-28’, it’s been a mix of Walleye and Sauger over the past couple days. As Walleyes begin creeping back toward the shoreline and eventually into the Rainy River, they expect to see more Walleye move through that area every day. Their sleepers are also set in that general area, but a bit shallower. Some of the anglers in these sleeper houses have reported catching larger "slot-sized" Walleyes around first and last light. Their ice road is in great shape for guests that choose to drive out. It’s about a 4 mile drive out now. Other roads in the area are in good shape as well. Going off road is still extremely difficult because of the hard packed snow. They are also taking bombers out to houses they have set up by Knight Island (22 miles) and continue to see great numbers of fish there. Lots of keeper Saugers and some Walleye mixed in. Based on current conditions and weather forecasts, they think fishing will continue until the end of March. Even though the rental shelters have to be off of the lake by March 31, the Walleye season does remain open through April 15th. So ya never know, there may even be a couple of late ice excursions if the weather stays cold. 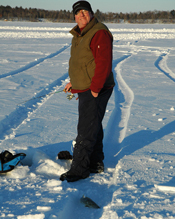 Ice Fishing Report February 24, 2011 Jeff Sundin Leech Lake Area lakes. For the second time this month, we've managed to dodge the big storm and now we're set up for a great weekend of ice fishing. A dusting of snow fell in the area on Wednesday, but not enough to cause concern for anyone heading this way for the last weekend of the Walleye and Pike season. In fact, you couldn't write a better script for the up-coming weather, cold enough at night to keep the ice in good condition, but not the kind of deep-freeze that makes you want to stay off the lake during the daytime. Fishing in the Itasca area is generally good, but there are still a lot of anglers who haven't figured out that it's okay to come out and play. Listen, it's really easy to get around right now! Most lakes have a little remaining snow cover, but there are huge expanses of clear ice and travel by 4 X 4 or ATV is a piece of cake. Ice thickness is good and getting better with reports ranging anywhere from 24 to 40 inches depending on the lake. Perch fishing on the large lakes is improving daily as the fish move toward prime feeding areas for their "pre-spawn" feeding binge. (2-24) I keep hearing more good news about Cass lake and Pike Bay Perch action. Fish are hitting in the dips and pockets on large flats in water depths of 8 to 12 feet. Key areas are located close to deep water, but not necessarily on the breaklines. Back in Allens Bay, there's been a pick-up in Perch activity too, but I don't have a solid report to share. Possibly, a stop at Froggy's Sports in Cass Lake will get you some additional details. (2-24) On Sand Lake, my friends Ron & Jacque Danielson from Chappel Hill Resort checked in. With ice conditions improving anglers no longer need to rely on plowed roads to find a fishing spot. Excellent Walleye and late Season Perch fishing is available within walking distance of their winter retal lodge. Listen, I've been in this lodge and it is gorgeous! It's got a Field Stone Fireplace, lots of large windows and wrap around deck over looking the lake, fully stocked kitchen, formal & informal dining rooms, Living room, 4 bedrooms, 3 bath. With futon & sofa sleeper in use sleeps up to 12. There's access to snowmobile trails and right now, ATV's will bet you anywhere on the lake. This would be a great headquaters for a family ice fishing trip! If your on FB, link up with Chappel Hill's new Facebook Page here. 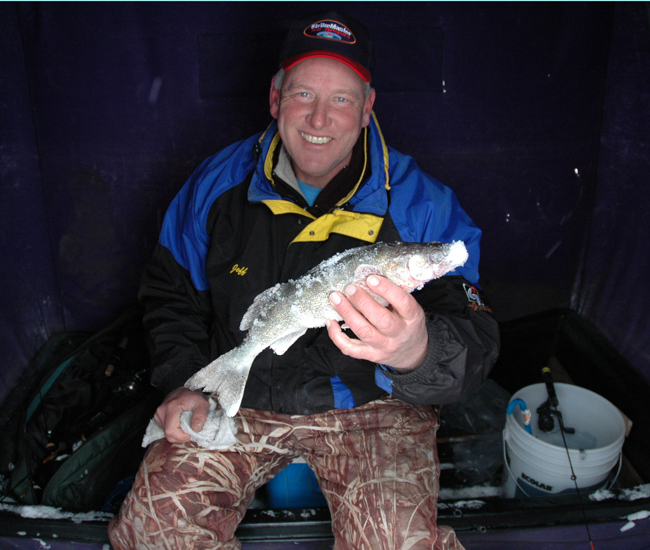 Ice Fishing Report February 23, 2011 Jeff Sundin Cass Lake Area Perch We're down to the wire for Walleye and Northern Pike fishing on inland lakes for the winter season. Except on Border waters like Lake of the Woods, Rainy Lake and certain border rivers, we're down to our last 5 days of Walleye fishing which ends on Sunday February 27th. The season ending is going to be a happy time for many of the rental operators on Upper Red Lake who have battled the snow and slush all winter long. They deserve a break for sure, but how about giving them one last weekend of brisk business to give them a positive send-off? Weather conditions are going to be good, ice conditions are good and the Walleyes are staging a little late season flurry right now. Closer to home, most of the Walleye and Pike anglers will simply switch over to Perch and Panfish for their late ice season angling. On most of the smaller area lakes, panfish are cooperating already and on the larger lakes, Perch action is picking up daily. (2-23) On Lake Winnie, Dixon Lake Resort let me know that the Northern Pike have been on the prowl again. Maybe it's the wind or maybe the full moon, but an up-tick in the action was a treat for their guests over the weekend. Most of the spear fishermen bagged limits of fish and one angler bagged a solid, ten pounder. For Perch, Walleye and panfish, they said fishing hads been good, but not great. Sunfish and Crappies are still in the shallow water, but after a winter of constant pressure, finicky fish are getting tougher to fool. Jumbo Perch have been located out deeper in water depths of 20 to 26 feet. You can find some fish on humps in that northwest corner, but fishing the deep side of shoreline breaks will work as well. (2-23) On Lake of the Woods, Jackie LaValla at Sportmens Lodges reports that in spite of last weeks warm-up, the roads and ice conditions held up well. They estimate ice thickness at 40 inches or more and while the Walleye fishing has tapered off a bit, anglers are still managing to catch enough to keep it interesting. Based on current weather and ice conditions, they estimate that operating on the ice will continue until March 31st. (2-23) Tulibee action has been above average all winter and it's improving even more now. Best action is during the mid-day using small jigs tipped with a waxworm or eurolarvae. For best action, fish in the 22 to 30 foot range and watch for suspended fish on your electronics. When you spot fish, lift the jig a foot or two above them. Watch Tulibee Video here. (2-23)On Lake Winnie's south end, Denny's Resort and Chris Dunker report finding good ice on 90% of the lake. Watch out for a couple of persistent trouble spots near Third River and north of "Moxies Hole". ATV's and Trucks with 4WD can go most anywhere on the lake. Perch activity is best during the morning and early afternoon. Walleyes are hitting during both the early and late twilight periods. Pat Rooney is giving folks a heads up to watch for suspended fish. He's caught Walleye at 5 to 8 feet below the surface several times over the past couple of weeks. Pat likes the 1/4 ounce Macho Minnow tipped with a minnow head and jigged aggressively. (2/23) Bemidji Lakes Area February 17, 2011 NMLOG Member, Paul A. Nelson in his own words; "The ice conditions in the Bemidji area are probably in better condition right now than they have been most of the winter. A significant thaw followed by a return to cold temperatures was just what the lakes needed to firm up the ice and get rid on some of the snow cover on the lakes. 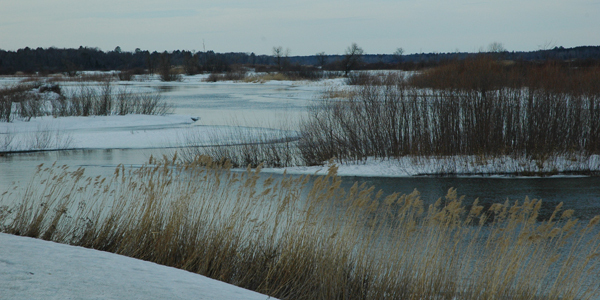 Anglers may still find areas of slush under the piles of snow, so anglers traveling on the lakes in vehicles should still travel in pairs with a tow strap and avoid the ice covered with snow drifts whenever possible. Walleye fishing has been picking up on most of the larger lakes in the Bemidji area. Anglers have been catching walleyes in the mornings and evenings on most clear water lakes, with a better day bite on the lakes with coffee colored water. Most of the walleyes have been making feeding movements into structure in 16-24 feet of water during peak feeding periods and holding in deeper water when they are resting. Perch have been split between deep and shallow water, with most of the larger females still holding in deeper water. Food is the key to perch location, with the schools of perch active and feeding when anglers can locate them. Crappies have been suspended over deeper water, with a decent day bite in many lakes if anglers can find the schools of crappies. Anglers should use their electronics and try to pick off the highest riding fish in the school first, to help avoid spooking the school. Sunfish have been on the moderate depth mud flats or in the old weed beds, depending on the lake. Some lakes will have crappies and sunfish mixed into similar areas. Anglers can use wax worms or eurolarve on small jigs and light line for crappies and sunfish in most situations". Ice Fishing Report February 22, 2011 Jeff Sundin Deer River Area Perch Somehow we've missed out on a major snowstorm again and local businesses are breathing a sigh of relief. The weather forecast for the week appears to be setting the stage for some good fishing opportunities in the Itasca area. Travel conditions on the ice are good and continue getting better. Perch action around the Deer River area is picking up. Lake Winnie action has improved steadily over the past few days with most angelers catching respectable numbers of Perch. Size varies from one location to another, but some of the best fish are coming in from the northwest corner of the lake. Fishing the breaklines on mid lake humps in 22 to 26 feet of water is doing the trick. On the southwest side of the lake from the snag-hole heading west toward the river mouth has been producing fish over the past week too. The shoreline drop-off in 18 to 24 feet has been the best in that area. Tamarack Bay has been producing fish for most of the winter, but there the deal is numbers rather than size. Lots of fish in the 8 inch range are keeping anglers busy as they weed through and sort fish in the 9 inch range to keep. (2-22) On Cutfoot Sioux, Bryan and Sue Harris at Eagle Nest Lodge mentioned that guests at the resort caught a mixed bag of Walleye, Northern Pike and lots of Tulibees over the weekend. They fished within sight of the resort and concentrated their efforts in water depth of 15 to 17 feet. They travelled by snowmobile from the resort, but ATV's would be fine now too. 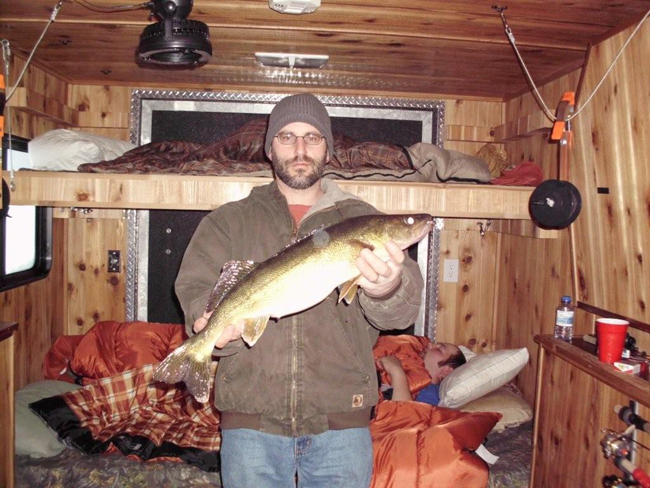 (2-22) On Lake Winnibigoshish, Chris Dunker checked in and let me know that their rental guests are seeing a pickup in the Walleye and Perch action on Lake Winnie. On Saturday evening their catch consisted of several Walleye and lots of Perch in the 9 inch range. Sunday morning was a real treat as they caught over 30 Perch in the 10 inch range and three more bonus Walleyes within an hour. Best bet for depth according to Chris was 20 feet of water. Best presentaion was a Northland Buckshot Rattle Spoon, Perch pattern tipped with a minnow head. Ice Fishing Report February 21, 2011 Jeff Sundin Ice Fishing Action Update. After a slow start to the weekend, anglers in the Itasca area are starting to get their fishing locations and presentations fine tuned. Now that we've had a few days of mobility on the ice and a chance to compare notes, fishermen are zeroing in on more productive places to fish. Figuring out which lakes are "hot" is a lot easier now that travel conditions have improved. Access to lakes is now generally good. Typically the only thing restricting free travel is whether or not the access roads and landings are in good condition. In some places, traffic during the recent warm up caused some ruts and slush pockets that might be challenging. Once you're on the ice though, travel by vehicle is very easy now. Over the weekend, Crappie and Sunfish action stole the spotlight, but Walleye, Perch and even Pike activity are on the up-swing too. All we need now are a few of those nice warm March days and we're in business! Yesterday, I had a call from my friends Bill & Chester Powell who had a game plan of heading to Cutfoot Sioux to try and catch a mixed bag of panfish, Pike and Walleye. The idea sounded great to me, so I tagged along. When we arrived at the Wiilliams Narrows access, it was apparent that a few guys had tried driving out before the cold weather had a chance to freeze the landing solid. There were some deep ruts in the ice that were formed when drivers attempted to plow through deep slush before it was solid. I'm afraid that you'll have to drive through that, bumpy-but-doable stretch until you're on the lake. Once I was on the ice, I was able to drive straight out to the fishing hole. Bill had been here on Saturday, so he already had the location figured out. A 22-24 foot mud flat where Perch, Sunfish and Crappies are sort of "milling around". The plan was to fish here for a while and then move to a better Walleye area. Once we started fishing, the action was slow-but-steady. First a Perch, then a Sunfish, another Perch, a Crappie and so on...There was almost always a fish or two visible on the electronics, but we had to spend some time working on them before they would strike. Chester was catching the most fish and his preferred bait was a Yellow/Orange Diamond Jig tipped with a tiny white plastic tail and sometimes a waxworm. I caught my share using a Glow/Red Mud Bug tipped with a couple of waxworms. The jig color seemed to make a difference because Chester was catching a lot more Crappies while I was getting mainly sunfish and Perch. Either way, everyone wound up catching plenty of fish for a nice fish fry. Now that we all had some fish, the rest of the plan kind of fell apart. There was wind blowing so hard that when I stood up and took the weight of the floor of my Otter, the wind would blow it over. The idea of moving to a new location, didn't really catch on with anyone, so we called it a day and went our seperate ways. (2-21) On Lake Vermilion's East end, Jay Schelde of Pike Bay Lodge says that fishing has been fair to good for groups out of his resort. Walleye and Jumbo Perch have been taken regularly in 25 – 34 feet of water near Birch Island. Travel had been restricted because of the slush and water during the warm-up, cold weather is helping to alleviate the problem now, but Jay is suggesting that anglers stick with snowmobiles for now. (2-21) On Lake of the Woods, Border View Lodge reports that they are on a good school of fish just north of Knight Island. There are lots of Saugers along with a mix of Walleye. Suspended Walleye are still roaming the deep mud about 7 miles off of Pine Island too. As they find larger schools of Walleye, they'll be plannin to return some of the rental fleet back over the mud. They added that there were some larger fish in the 26 and 27 inch range caught over the weekend, so the outlook is good for some late season trophy Walleye action. 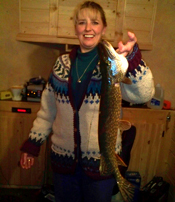 Northern Pike action is beginning to get folks interested now as well. A couple of their anglers headed out with tip-ups and caught a few Pike, hooked others and had encounters with a couple of big ones that escaped. It's early to get too enthusiastic, but the Pike are starting to show up and the outlook is good for the next few weeks. Ice Fishing Report February 20, 2011 Jeff Sundin Ice Anglers Are Free To Roam ! Saturday didn't work out quite like I had planned, but we did manage to get out on the lake for a while. Continuing the saga of the doomed Northern Pike video, our recording session ended before it began when our wanna be, Stephen Speilberg couldn't make the trip. With teenagers in tow, you never know how late or how long, but eventually I got everyone into the truck and we made our way over to Ball Club Lake. Conditions on the ice were 1000 percent improved from a week ago. There are still some high spots of snow on the ice, but there are also huge expanses of clear ice too. I avoided driving on most of the snow drifts just because it made me feel safer, but driving around them and staying on the clear ice was a piece of cake! As I drilled the first few holes, I noticed that there is still a fair amount of moisture in the ice. How long we have quality ice is going to depend on how long the cold weather lasts, but It looks like we could be in for an early ice out. Since we didn't really have a mission any more, our fishing turned into more of an exploration. We drilled a bunch of holes on some new spots and hopped around looking for some evidence of a new "mother-lode" of fish. Oddly, I marked fish in almost every hole, but except for the smallest Perch, most fish had lockjaw. I was expecting to hear some glowing reports from somewhere, but around the area, I got similar reports from friends who were fishing most everywhere. Way more anglers than usual, but not many of them catching fish in good numbers. I have to believe that the action will pick back up soon as anglers figure out some new haunts and get zeroed in on these late season locations. (2-20) Echoing the sentiment about a slowdown, Ron and Tracey checked in From Wishbone Resort on Cass Lake. Tracey said that areas where Perch had been coming in fast and furious last week had slowed down suddenly with the arrival of the cold front. She mentioned that the snow cover is almost completely gone now and with brighter conditions under the ice, anglers will probably need to fine tune their locations. (2-20) On Red Lake, fishing action hasn't been tremendous, but there was an up-tick in Walleye activity over the past few days. Of the anglers that are out on the lake, more groups are reporting catching Walleye limits. Mobility is probably helping since it's easier for anglers to find water that hasn't been fished. The best action has been out on the mud-flats in 13 to 14 feet of water. (2-20) On Bowstring Lake, Darv Oelke reported that travel conditions are much improved. Perch and Crappie action is steady with the best numbers of Perch coming from 16 to 18 feet of water. Crappies are out a little deeper and abglers are having better results in 22 to 24 foot range. Ice Fishing Report February 19, 2011 Jeff Sundin Ice Anglers Are Free To Roam ! Because of all the wind, it was a little un-pleasent getting here, but it's over now and the re-freeze has arrived. For most anglers, it's been a winter of sitting on the sideline hoping for some good news about the ice conditions. Well its here now and if you want to fish, then go fish! You'll be happy when you see that snow and slush problems on most of the Itasca area lakes is gone completely! On our Friday afternoon tour, the lakes we checked had clear, blue ice in every area except under what once were the deepest snow drifts. Even the deeper snow drifts were saturated with water and are now frozen solid too. The forecast for today seems to be playing into our hands, with a predicited high of 18 and winds at 5 MPH. So it looks like the coast is clear for a big time fishing trip! With one more week of inland water Walleye and Pike fishing left to go, every option is on the table. (2-19) FISH FOR FREE! That's right, this weekend the DNR sponsors the Take a Kid Fishing Weekend. Any adult Minnesota Resident can fish without a license this weekend as long as you bring along youth under the age of 16! Never tried ice fishing? Give it a whirl this weekend and when you find out that you love it, you can get your license next weekend! Ice Fishing Report February 18, 2011 Jeff Sundin The re-freeze is on! This morning reminds me of one of those "don't ask for it, because you might get it" mornings. Oh yeah, the colder weather is here alright, 12 degrees and about a 30 MPH wind gusting through the rafters all night long. One good thing, the wind ought to help chill the ice surface down even faster and speed up the re-freeze. For Saturday, calm winds and temps in the middle teens should give everyone and ideal weekend for ice fishing. I was already getting great reports about the ice surface by noon on Thursday, so by this weekend, there are going to be tons of new places you can visit by truck, many of them haven't seen vehicle traffic all winter long. It's a sure bet that almost everyone who has plowed access roads will be breathing a sigh of relief this morning. Also certain, is that roads will now stabilize and improve for the weekend. So for now, I'm going to keep all of the updates about road accesses in it's own section. If you're looking for a quick update or new information about where to get on the lakes. 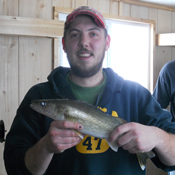 (2-18) On Lake of the Woods, Eric from Border View Lodge checked in with a report. Walleye fishing has been great. Rental houses that they have up beyond Knight Island are getting really good numbers of fish, mostly Sauger with an occasional Walleye or Tulibee mixed in. Clower to the lodge, 7 miles off of Pine, they are still "working over" the suspended Walleye. Fishing action has been spotty from house to house, but everyone is catching fish and Eric added that some of the houses have been absolutely crushing the Walleye. Almost every Walleye caught has been keeper size or larger with most of the fish have been running 15-17 inches and 20+ inch fish common. Ice Roads are in good shape, but not available to the general public. Lodging and rental shelter guests have excellent access to all location by roads that are described by Eric as "high and dry". (2-18) Lake Vermilion, Ely Area Trout Lakes Lake Trout fish has been "sporadic" for Paul Pollock who says that Lakers are notoriously finicky and this season has been no exception. Paul says that they've caught trout on most outings, with only one skunking so far. Describing the action he says its "been in short, distinct windows of opportunity. Stare at the Vexi for hours and then, BAM! The trout show up and bite aggressively for and hour or so and then it's back to a terminal case of Vexi-Vision. That's laker fishing in a nutshell". (2-18) On Sand Lake, my friends Ron & Jacque Danielson from Chappel Hill Resort checked in. With ice conditions improving anglers no longer need to rely on plowed roads to find a fishing spot. Excellent Walleye and late Season Perch fishing is available within walking distance of their winter retal lodge. Listen, I've been in this lodge and it is gorgeous! It's got a Field Stone Fireplace, lots of large windows and wrap around deck over looking the lake, fully stocked kitchen, formal & informal dining rooms, Living room, 4 bedrooms, 3 bath. With futon & sofa sleeper in use sleeps up to 12. There's access to snowmobile trails and right now, ATV's will bet you anywhere on the lake. This would be a great headquaters for a family ice fishing trip! Get more info here. (2-18) Aquatic Invasive Species is high atop the list of agenda items for anglers in 2011. Anglers For Habitat passed along some info about Minnesota Waters in partnership with MN DNR. They have scheduled 4 public AIS meetings about aquatic invasive plant species management. Anyone who wants to learn about or share their input on AIS plant management is invited to attend these meetings. (2-18) I stopped in Deer River for a visit at Fred's Bait Shop on Thursday and talked with Bill Powell who told me that until now, most of the traffic coming through the store had been anglers heading for Lake of the Woods. Walleye reports have been good up there for most of the winter, so it's naturally been a preferred destination. Rumors of much improved Perch fishing on Lake Winnie, Cass Lake and Leech Lake should help encourage folks to stay a little closer to home now, so they're anticipating an up-tick in traffic. While I was there, a former neighbor of mine dropped in and told me that he's been out on Big Cutfoot Sioux this week catching Crappies, Sunfish and Tulibees. He told me that he was already driving his pickup truck "anywhere he wanted to go" by this past Wednesday. He said that panfish action has been good in deep water using small jigs tipped with medium sized fatheads or waxworms. Ice Fishing Report February 17, 2011 Jeff Sundin The re-freeze is on! Here we go, one more day of warm temperatures and then the moment we've all been waiting for will arrive! With temperatures climbing over the 50 degree mark on Wednesday, there was water standing everywhere. Sloppy, mushy and slippery roads wherever you go, but they were pretty as a field of daisies because the next stop is going to be drive anywhere, fish for anything, ice conditions. I took a tour of the area on wednesday afternoon and found out that the only real trouble spots we're going to have left over are the access points at the landings. Snow that's been piled high over the winter by plows will be lingering for a while, but once you get past that, the surface of the ice is going to be great. Some of the places I spotted were almost snow-free, nothing left but standing water. Other areas have snow remaining, but it's so saturated with water that it will freeze solid as a rock once Fiday's cold-snap arrives. Lake access and ice roads are available for the weekend, the news is good! Photos 2-16-2011 Left to Right; Denny's Resort - Lake Winnie, Richards Townsite -Winnie, Nodak Lodge - Lake Winnie and Mississippi River on Hwy 2, West of Deer River. (2-17) on Upper Red Lake Ryan Klein, Ryan's Red Lake Rentals is coming down to the wire for the season. With only ten days of inland season Walleye fishing left on the calendar, he has his shelters moved back in toward shallower water where the full moon effect is kicking in right now. As Walleyes move toward the shoreline to stage and feed before spawning, action should be heating up for one last burst of action. Ice conditions are good on Red Lake where Ryan says the ice surface is almost dry right now. There's water mixed into the snow and with the colder weather heading in, the ice conditions will be perfect this weekend. (2/17) Bemidji Lakes Area February 17, 2011 NMLOG Member, Paul A. Nelson in his own words; "Lakes in the Bemidji area lost some snow cover this past week after several days of temperatures in the 40s. The snow on the lakes is beginning to compact, which should make travel easier for anglers looking forward to some late season ice fishing. The extended forecast predicts a return to colder temperatures this weekend, which should firm up the ice conditions that were getting a little sloppy with all of the melting snow. 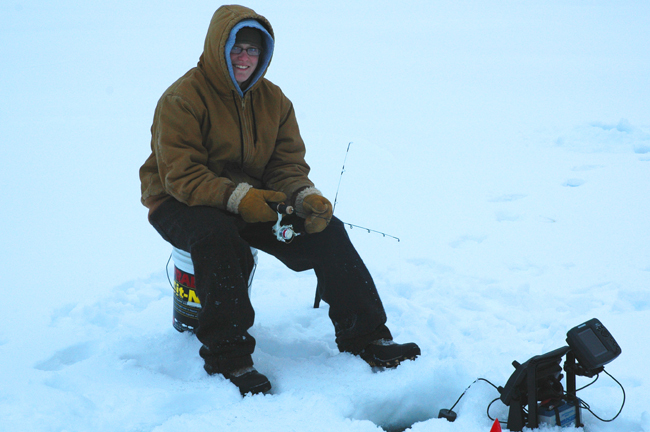 As long as the temperatures stay below freezing each night, the ice fishing season is likely to continue. The end of the ice fishing season usually comes after consecutive nights when temperatures stay above freezing. Fishing has been picking up in most lakes, with the best bites in the evenings for most species. Walleyes have been feeding in 16-24 feet of water in most of the larger lakes. The hot lure for many anglers has been a Northland Live Forage Spoon tipped with a minnow head. Crappies have still been suspending 5-15 feet off of the bottom in 25-40 feet of water in most of the smaller lakes. Crappies are visual feeders and will take small plastics or small jigging lures just as well as real minnows in many situations. Perch anglers are finding schools of perch on both the shallow weedy flats and in the sticky mud areas in deep water. The deep perch are feeding on bloodworms and mayfly larvae and the shallow perch are feeding on minnows and crayfish. Ice Fishing Report February 16, 2011 Jeff Sundin The Meltdown is on! Okay, this is it. After today, we've got a whole new ball game. Just in time for the weekend, weather forecasters are predicting the next re-freeze for Thursday night - Friday morning. Temperatues back down into the low single digits mean the end of the meltdown and the beginning of a whole new ice fishing season. I don't know about you, but I'm looking forward to some great days ahead as our mobility improves and the fish start snappin'. Listen, on Tuesday I was flooded with emails from anglers wanting to know where they would be able to get on to the lakes and fish this weekend. Today, I will get a complete report from everyone I know of who has a road on to any of our area lakes. There will be plenty of places to go this weekend, but with one more day of warm temperatures, we just need to see how the snows settles today. PUH-lease... check the report again early on Thursday morning for any updates that I publish later this evening. Another common question from Tuesdays exchanges was whether or not the ATV or Snowmobile would be the best way to travel this weekend. There's still a lot of snow out there and snow machines will get you around very well. But, the snow surface is going to be hard and crunchy. For me, it's no choice because the ATV is what I have, so that's what I'll use. But don't shy away from bringing the sleds, they're still going to get you areound just fine. For everyone who wants to drive a truck, the conditions for this are improved already and going to get even better in the next 36 hours. For now, the issue is going to be slush and soft snow, especially near the landings. In the past 24 hours, the snow was so soft that driving everywhere, plowed roads or not, has been a wet proposition. But even yesterday, trucks were popping up in places where no one has seen vehicle traffic all winter long. In other words, there are getting to be more areas where the snow has packed down or mixed with surface water and flattened out. As tthe temperatures drop, travel conditions will improve big time! (2-16) On Leech Lake, Perch action has been consistent in the area near Second Duck Point. The road access from Pine Point is wet, but still in good condition. 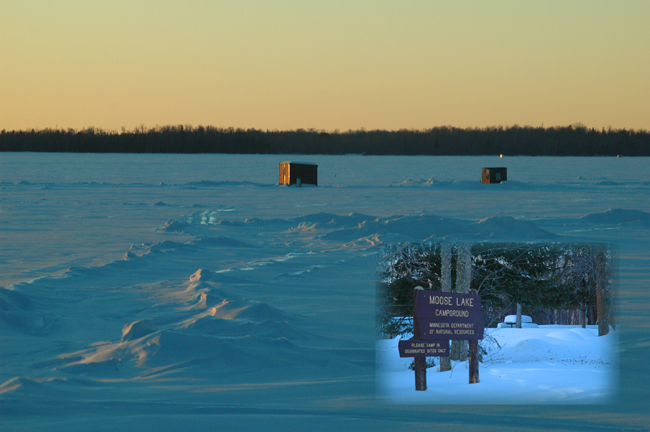 on Leech Lake, the Ice Road Access at the Northeast corner of Portage Bay, North Star Resort. My friend drove in to have a look yesterday and said that there was a lot of "rough looking snow" out there, but added that there were a couple of vehicles that had made their way out to private fish shelters. This ice road has been out of commission for most of the winter, but it might be ready to make a comeback. Don't go out of your way to try and use it, but if you're in the neighborhood, swing in and check it out. I'm not sure if anyone knows whether the fish are hitting in this area or not, but whenever we can get out there, it should be good, untapped water for the spring Perch bite. 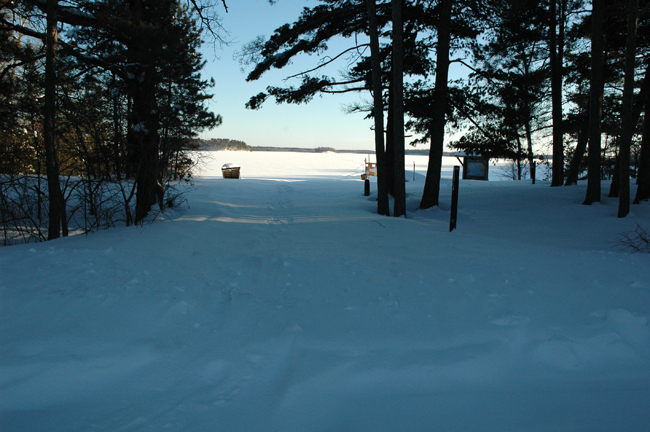 (2-16) Leech Lake, Pine Point Access is still in good condition and the road is open to the public. (2-16) On Ball Club Lake, trucks have begun moving around on the ice without the benefit of a plowed road. For now, I'd wait because there are some deep, slush holes out there, but it looks like travel conditions will be good on Ball Club for the up-coming weekend. (2-16) Todd Hammill of Wired2Fish was on a small Grand Rapids area lake hunting for Northern Pike with his brother in law, Todd Stone. They reported spotting over a dozen Pike in just a few hours. Most were on the small end of the scale, but they finally bagged a hefty one. Peering down the spear hole in about 12 feet of water, they reported seeing good numbers of Perch moving through as well. (2/16) On Ottertail Lake, professional guide and NMLOG member Ross Hagemeister Says finally, it's the snow's turn to take a beating on Ottertail and area lakes! It could be nearly melted and gone by the end of the week. For now, you still need to put the truck in 4 X 4 drive, but at least you don't need a snow plow any more. Perch and walleyes are both in predictable feeding modes and can be caught both in shallow and deep zones throughout the lake. Ross adds that panfish on Ottertail County area lakes are "pretty good", but its still a bit early for the fast, late ice action. For right now, the panfish appear to be feeding infrequently, with good action on about every third day. Ice Fishing Report February 15, 2011 Jeff Sundin The Meltdown is on! Ice conditions on Northern Minnesota Lakes will continue to change daily. The air temperatures on Tuesday were warm enough to keep the snow melting and settling, but not so high that it caused any full-scale flooding. Similar conditions predicted for today should help keep things moving in the right direction. Use this link to jump to the summary of Ice Road Accesses for a quick view of current conditions. Fishing activity in the Deer River - Cass Lake area is on the verge of some changes based on normal seasonal movements too. As we move toward March, you should expect to hear more reports about improving Perch action as the fish go into their "pre-spawn" feeding mode. In fact, Perch fishing on Lake Winnibigoshish and Cass Lake has been improving steadily during the past few days. On Winnie, reports from both the East and South ends of the lake are encouraging. On Cass, the shallow water on the Northwest side has started to produce. I had an interesting exchange with a friend, Nathan Harder on my Facebook Page that I want to share with everyone. It helps clarify my philosphy about fishing reports and I why I take the time to post them. A) Nathan, Actually you've seen several reports about Pokegama, I just haven't mentioned it by name very often. We fish the lake a lot and it has tons of nice fish in it. I tend to shy away from naming places that could be damaged by too much pressure. It's one thing to say that Walleyes are hitting on Leech lake, quite another to mention a specific 100 yard long weedline. With me, you have to read about the trends and then apply the patterns to the lakes you're fishing. There are a lot of great places to fish in Minnesota and most all of them have their "peak times" and their "dead times". The trick is catching the trend when it's likely to be best for your favorite lake. That's what the reports are all about, I give you a heads up, but I like it best when you use the knowledge to figure out part of the equation on your own. I love fishing and I love it that people want to come here to fish in this great part of Minnesota. I want to do everything I can to make your fishing trip more enjoyable. I do try to drop enough clues into every report that it gives thinking anglers a head start, but not so many that the fish are all gone by the time you get here. (2-15) On Cass Lake, Jason Ball at Cass Lake Lodge reports that melting snow has created wet, but not slushy conditions on the plowed roads near the resort. Jason says that with 24 to 30 inches of ice, conditions are still good. They are planning to keep the roads open and add some new ones too. Water is likely to continue building up for the next couple of days, after that, watch for serious improvements. (2-15) On Pike Bay, Perch action has been good on the shallow side of the bars. Travel has gotten to be problem temporarily because of the water, but access is still available. (2-15) On Lake Winnie, Chris Dunker continues to use roads out of Denny's Resort on the South end of Winnie. For the most part, the roads healed up over the past week. Obviously, the past couple of days have been getting a little wet. Fishing had slowed for a while, but they've moved their houses into shallower water, closer to shore and they've had good reports during the past two days. (2-15) On Lake Winnie, Highbanks Resort Continues to limit their access to trucks and ATV's with portable ice shelters. Wheel houses are not permitted at this time. They are watching the changing conditions though and will re-assess the policy after the warm weather passes. Perch action on the East side of Lake Winnie has been heating up during the past couple of days. From Highbanks, heading out to the humps and fishing in 24 to 30 feet of water is producing. Ice Fishing Report February 14, 2011 Jeff Sundin The Meltdown is on! TAKE NOTES, As of today, ice conditions on Northern Minnesota Lakes will be changing daily. Some for the better, some not, but rest assured that they will change. This big melt-down is exactly what we need though and as messy as it may get in the short term, the next cold snap will bring us lots of great new ice fishing options. In the meantime, there are plenty of good spots to fish already and there are plenty of fish biting too. On Sunday, my own experience was on Pokegama Lake near Grand Rapids. I met Jason Green, his son Ryan and their friend Nate Huntly at the landing just after 11:00 AM. I took Nates advice and showed up with my 4 Wheeler and portable shelter. For yesterday, I might have been pushing my luck a little because the warm weather was making the deep snow soft and slushy. That said, I did manage to get accross from the Mishawaka Landing into Sherrys Arm, getting stuck only once along the way. Heading home, I managed the same track record, but this time the snow had become even wetter and more slushy than the first. Conditions on the lake were really pretty good though and once we got into our fishing territory, walking around was fairly easy. As soon as the next cold snap comes through, travel by ATV will be a piece of cake and conditions may even get good enough to allow travel by truck. Our goal was to catch some Pike for a video that we've been working on. I was really excited when I first saw the bucket of minnows we had for bait. Nate and his sons had been spearing ealier in the morning when a school of smelt moved under their hole. They caught a bunch of these using small hooks tipped with wax worms and the bait looked so good that I wanted to eat it myself. We started drilling holes and setting tip-ups along the breakline in 15 to 25 feet of water. I'm convinced that this project has been jinxed. It doesn't matter where we go, the Pike mange to snub us every time. In a five hour period, we manged to catch two Pike, I got one on an airplane jig tipped with a small smelt and the other one was caught on a tip-up with Smelt on a quick strike rig. Back to the drawing board for the Pike, but I will say that it was a wonderful day. Warm, windy and really spring-like. (2/14) On Lake Winnie, The folks at Dixon Lake Resort have been forced to close the access road to truck traffic for the rest of this week. Sunday's mid 40 degree temperatures finally melted enough snow to cause some serious slush problems. The plan is to re-open the road for next weekend, but be sure to check the reports before you head up there. If warm weather continues longer than expected, re-opening the road could be delayed. When they do re-open, remember to say thank you by dropping a few bucks into the donation box on the road. (2-14) Checking in from Red Lake, Chad Benson says that he's noticed a real increase in the number of "Bottle Bass" biting lately. Unfortunately, the Walleye action hasn't been keeping pace. Chad says that his rental groups are still picking up 4 to 10 fish on each outing, but the anticipated Valentines Day feeding frenzy hasn't kicked in yet. Cass Lake has been a brighter note for Chad though. Over the weekend, he got a couple of his rental houses set up on Cass and began finding some of the better Perch fishing locations. Fishing in 9 feet of water, his nephews Rowdy, Hunter and Landon Benson had a blast watching the fish move around the ice, picking and choosing which fish that they would allow to bite. The boys had a Musky sighting and an episode with a nice Pike too, but for now, he's the one that got away. (2-14) On Bowstring Lake, Bowstring Shores Resort, Darv Oelke Had some better news this week as the road and ice conditions on Bowstring have improved. Darv noted that there was a lot of snowmobile traffic on the lake this weekend, so apparently slush problems under the snow is clearing up as well. Perch action has been good recently with Jumbos hitting well in the 16 to 18 depth foot rangeDarv added that Crappies are eginning to mix with Perch at the same depths and anglers are starting to pick up a few bonus Crappies as they fish for Perch. (2-14) On Ball Club Lake, Gus' Place Resort is echoing the predictions of improved conditions as the meltdown and re-freeze occurs. Fishing on Ball Club continues to be a mixed bag of Northern Pike and Perch. Walleye action remains slow and late season panfish action hasn't picked up yet. Gus added that once mobility improves, anglers should have better access to some of the preferred panfish haunts. Northern Pike and Perch are in the 20 to 25 foot depth range and anglers have noticed that Perch have preferred a meal of shiny jigs tipped with 2 or 3 wax worms. Ice Fishing Report February 13, 2011 Jeff Sundin Thirty two degrees above zero at 5:00 AM, not bad! According to the forecast, we'll have to put up with some wind today, but with temps near 40 degrees, it's going to make it awful hard to find an excuse to do anything but get outside. Talking with friends yesterday, it seemed like everyone has the same idea, so I'm expecting a line of traffic at Fred's Bait this morning. Surface conditions have continued to improve throughout the area and this warm up is going to be icing on the cake for a bunch of lakes. For the next few days, melting snow is going to make for wet conditions in some areas. But within the week, we'll have a ton more places to go. Our destination today is Lake Pokegama and according to a friend who was out there yesterday, ATV's will be back in vougue for our trip. After his travels on the lake yesterday, he reported only one slushy area between the landing and his dark house. The game plan is to fish for Pike, which have been active throughout the week. Hopefully, I'll have a nice report about the trip for tomorrow morning. (2/13) On Lake Winnie, The folks at Dixon Lake Resort have been heroes to everyone this winter. They've kept their road into the Third River Flowage open and in passable condition for the entire season. On Saturday, they reported that the slush is getting more troublesome, but they are still staying ahead of the game. Fishing pressure has been heavy up there this winter, so the action is starting to slow down. But nice Sunfish, Perch and a sprinkling of Crappies are still providing entertainment for most anglers. For the darkhouse anglers, Northern Pike are still moving and some nice size fish continue to be bagged by spearing. Before you head out on to the lake, remember to say thank you by dropping a few bucks into the donation box on the road. (2/13) Wired2Fish aired their first of a series of "mini-shows" last week on Versus. They have the first show on the site now. View the show, Spoon Fishing with Marty Glorvigen. Ice Fishing Report February 12, 2011 Jeff SundinWintery weather is giving way to some friendlier days ahead. It's about 20 degrees warmer right now than it was when I wrote the report yesterday morning. With a predicted high of 30 degrees today, I think anglers will be bursting at the seams to get outside. Before this is over, it could get a little messy for a while, but it looks like this time, we just may fianally reach the final hurdle. There's a great chance that we'll see ice conditions improving in a hurry this week. I'm heading out to Grand Rapids for Ray's Marine, Customer Appreciation Days. So on your way to or from the lake, stop by and say hello any time from 8:30 AM to 5:00 PM. I'll be around all day long to chat about fishing, boats or whatever you have on your mind. As a bonus, I'll be doing seminars at 11:30 AM and 2:30 PM called "Check Out That Humminbird". Ray's Sport & Marine, Grand Rapids, MN It could be a great time to get some tips on how to fine tune your Ice-55 or Ice 385ci before you head out on the water for the afternoon bite. I had to throw in a little comment I got on my facebook page from Nick Perkkio - "Hi Jeff, Just bought an ice 55 last week! Best flsher I've used!" View comment. (2/12) Arnie Nichols and his son-in-law Jon Jaeger took the opportunity to head out for some Crappie fishing on Rice Lake. They wanted to get out there while the weather was still cold enough for travel across the lake on a four wheeler. Arnie said that they had to travel some distance to get to their favorite crappie hole, but they did get there on the ATV. After punching a lot of holes and then moving from hole to hole, Arnie says " we found some fish showing up on the Vex". It was lit up like a Christmas tree. They were soon rewarded with several nice crappie. Crappies in this lake are not huge, but they are good eaters and they were able to get their limits in time to leave the lake just at dark. With the warm weather coming, it could be difficult to get to this area during the melt-down, but access will improve with the next re-freeze. (2/12) Captain Josh Hagemeister, member to the Northern Minnesota League of Guides reported in from Central Minnesota. Josh says "Walleyes are starting to get the usual "February bite" going. However I've been concentrating on panfish due to client demands. Bluegills are being found a bit deeper and further away from the weedlines. Tiny jigs tipped with waxies are working fine in the depths of 15-25 ft. Crappies are behaving like their predictable selves. Many are being caught suspended anywhere from 4-12 ft off the bottom. Bottom depths range from 25-40 ft. A plain minnow rig along with the basic "Genz Bug" tipped with ta grub will cover most situations. Work the "bug" on 3 lb. line and the minnow on 4 lb. line. Morning bites are lingering into the 10:30 am range and the afternoon bites seem to begin picking up around 3 pm--however fish are being caught all day". 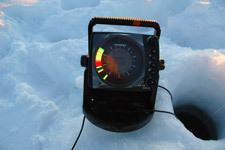 Ice Fishing Report February 11, 2011 Jeff SundinOkay, so listen up! Ice conditions are really improving! I know that all winter long, its been pounded into your head that deep snow and slush are causing problems everywhere. While conditions aren't exactly perfect yet, there are more new options cropping up every day. It takes a little while to clear all of the bad news out of the system, but conditions have taken a turn for the better already and the weather predictions for the next week should be helping even more help. (2/11) I'm off of the water for a couple of days. Today, I'll be preparing for my Saturday Seminars "Check Out That Humminbird" and Saturday I'll be at Ray's Sport & Marine, Grand Rapids, MN for two seminars 11:30 AM and 2:30 PM. I would love to see you there! (2/11) Wired2Fish Update A few years ago Normark Corporation announced a new line of soft bait that utilized what they call "Ultrabite Aggression Pheromones" to increase your catch by stimulating the fish's internal receptors. A dose of "fear" and a dose of "aggression" pheromones scientifically formuated to mimic the natural predator versus prey response. From this Trigger X was born. We want three Wired2Fish anglers to have all of the new Trigger X products in the best colors and a bottle of the new Trigger X Rejuvenator Spray as well. All you have to do is know a little about Normark and a little about Rapala to answer the questions correctly for a chance to win. (2/11) On Thursday, I and Arne Danielson took an afternoon "bussmans holiday" to pay a visit at Wishbone Resort on the West side of Cass Lake. Ron Miller of Wishbone and Chad Benson are teaming up and ramping up for the up-coming late ice Perch fishing on Cass Lake. Ron greeted us on the ice and helped us get the lay of the land, pointing out locations of the plowed roads that they've already finished. After that, hoping to find a great new school of "un-tapped fish", I and Arne went on a little fish scouting mission. As it turned out, fishing wasn't the highlight of our afternoon, instead it was the fantastic ice conditions that wowed us. Settling snow, sub-zero temperatures and even simple evaporation have combined to clear up all but the most stubborn slush spots. The network of roads that they've cleared from Wishbone's private landing out into the Western portion of the lake is clear, dry and headed toward some really good, classic winter Perch spots. 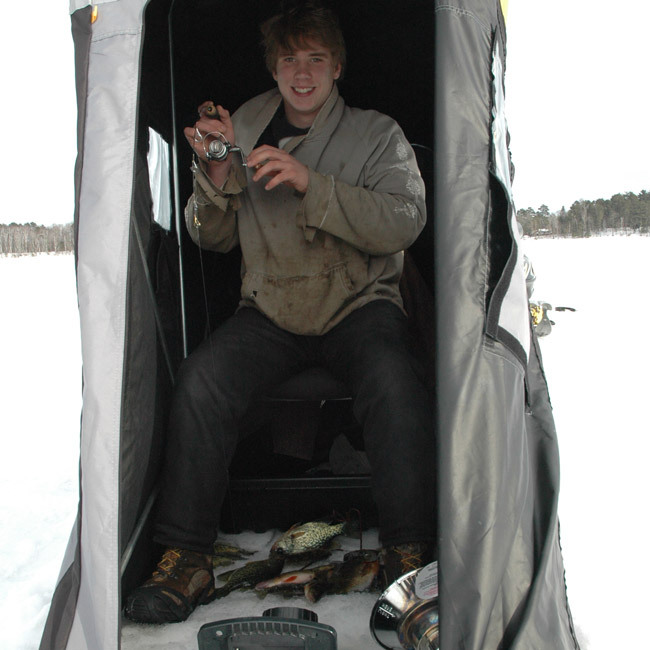 Wishbone Resort and Chad's Rentals will have rental shelters and lodgiing available within a few days, so if you're thinking about a late season Perch trip, this is a great time to get in touch. (2/11) On Cass Lake, Jason Ball, Cass Lake Lodge Supports the claim that ice conditions on Cass Lake are improving. 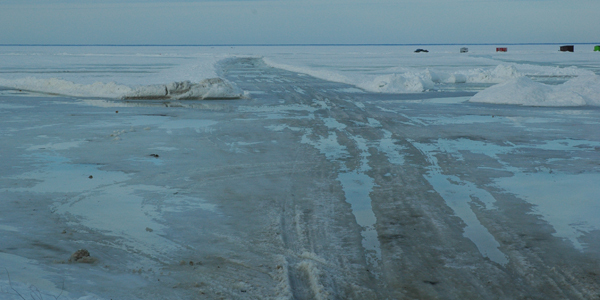 Cass Lake Lodge has roads plowed on the Southwest part of the lake. Thanks in part, to the current cold snap, roads have gotten harder and the number of slush pockets is greatly reduced. Travel off of the main roads is possible, but there are still slush pockets in certain areas under the deepest snow drifts. The walleye have been biting in 16' to 20' in the early morning, dusk, and at night. The jumbo perch have still been in shallow, 6' to 10'. (2/11) While we're on the subject. The Cass Lake Area Chamber of Commerce - Palace Casino Winter Fishing Challenge event is this Saturday on Cass Lake. Headquarters for the on-ice portion of the event is Break On The Lake Resort, just up the road from the Palace Casino. (2/11) On Red Lake, Ryan Klein has a few more weekends of Walleye fishing to look forward to. He recently switched some houses from shoreline rocks out to a gravel area adjacent to the mid-line. All of his rental customers are still catching fish in the 5-10 per day, per house range. Ryan added that from past experience, he's always seen an upswing in the later season action that begins on about Valentines Weekend. Warmer temps and some stable weather for the next few days will be good and Ryan expects that fishing and ice conditions will keep getting better from here on out. Walleye fishing on Red Lake has been best in the early morning and late evening. He said that he's been stressing the importance of keeping the shelters dark. Fishing with the lights off around dark seems to be helping improve the action when the Walleyes are finicky. (2/11) Acorn Hills Resort on Leech Lake Rich sent us this note; "We finally moved our houses onto Walker Bay, good ice, and good fishing" - 800 237 1015. (2/11) Also on Leech Lake, Norm Teegardin from the Shores at Pine Point reports that Perch action had slowed in the Goose Island area. They've recently begun plowing new roads and moving some of their rental shelters into the area near Second Duck Point where fishing action has been better. (2/11) From Bowstring Lake, The news is getting better too. Darv Oelke is away from the resort right now, but he's been staying in touch with friends on the lake who say that slush and heavy snow is finally clearing up. Travel conditions are still less than ideal, but the outlook for some good late season Perch and Crappie action are getting better all of the time. (2/11) On Ball Club Lake, Gus' Place Resort has reported that slush problems are still hampering efforts to expand his plowed road system. But they do have enough roads plowed to allow his customers access to some decent fishing spots on the drop-off. Walleye action has tapered off recently and Gus calls it "un-reliable", but the Northern Pike and Perch action remains consistent. Gus says that Pike have been aggressive! On certain days, some of his groups have reported catching more Northern Pike than Perch. For now, they continue to fish in water depths of 20 to 30 feet. They anticipate that the fish will soon be moving shallower as warmer weather and seasonal movements begin to take affect. When you're forced to follow the crowd, one great way to find water that hasn't already been fished really hard is to make sure you bring along a GPS equipped with a recently updated map chip. Sometimes we have a habit of following plowed roads to where all of the other ice shacks are, but we forget about nearby structure that we pass along the way. For me, the map allows me to watch for interesting structure as I pass along the road. If I see a spot within walking distance that hasn't been fished, I'll park the truck and hoof it. You'd be surprised at how many times perfectly good fishing spots go un-noticed because everyone has been following the crowd. 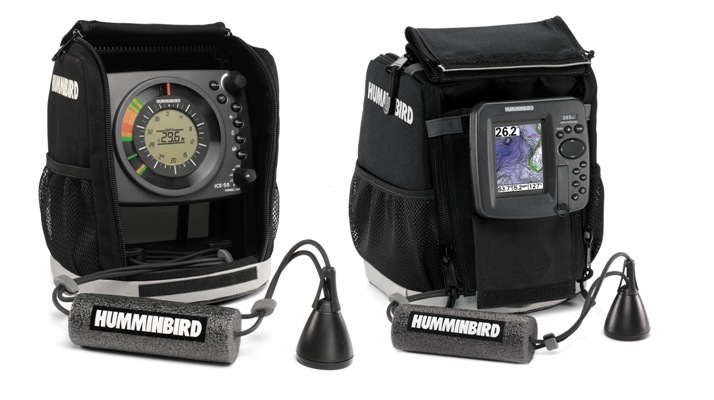 Humminbird has made the job even easier for me since they introduced the ICE-55/385ci Combo. Now when I need to make a move, I can switch screens between the Ice 55 flasher and the 385ci GPS and head to a new area without ever missing a beat. 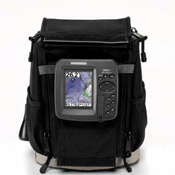 When I get to the next spot, I just switch back to the flasher screen and I'm ready to fish. Ice Fishing Report February 10, 2011 Jeff Sundin Another bright sunny day on Wednesday almost tempted us out onto the lake. But for a walk-in trip, sub zero temps and a brisk wind held us at bay for another day. It sounds like the winds will moderate today and hopefully this is our opportunity for a re-match. If not, I'm going to drum up a rental shack so we can sit inside, nice and warm! (2/10) I'm keeping my words short today because I've got lots of reports coming in. I'll be updating the page most of the morning, so if you have a few words to add, please do! This afternoon...here fishy....here fishy....for sure! (2/10) Bemidji Lakes Area February 10, 2011 NMLOG Member, Paul A. Nelson in his own words; "Cold weather gripped the Bemidji area again this past week, but there is hope on the horizon. A February thaw is predicted for this weekend, with warmer temperatures expected into next week. Fishing has been slowly picking up for all species, especially on the warmer days. Walleyes have been most active in the evenings, with most fish sticking tight to structure in 16-24 feet of water. Crappies have been suspended 5-15 feet off the bottom in 25-40 feet of water in most lakes. Perch have been biting both on the edges of the mud in deeper water and on top of the weed flats. (2/10) It's time to start talking boats and electronics. I'd love to see you at Ray's Marine Customer Appreciation Days this Saturday! (2/10) On Ottertail Lake, professional guide and NMLOG member Ross Hagemeister says that the fight with snow on Ottertail Lake is easing. Travel conditions on the lake still aren't perfect, but Ross rates the lake access at about a 5 out of 10. Ross' outlook is optimistic and he believes that If the wind stays down and the expected warming trend arrives, conditions will improve to a rating of 7 by the end of next week. Fishing on Ottertail is good right now, as long as you can get to a spot to fish walleyes you will catch some. Ross added "As we approach mid February, the walleye's feeding urge is intensifying and it's apparent in the way they approach our baits right now". If you're heading for the Ottertail area right now and don't have a plow, then snowmobiles are still the way to go. Or, you could save yourself the trouble and call Ross Hagemeister, Meister Guide Service 218-495-3140. 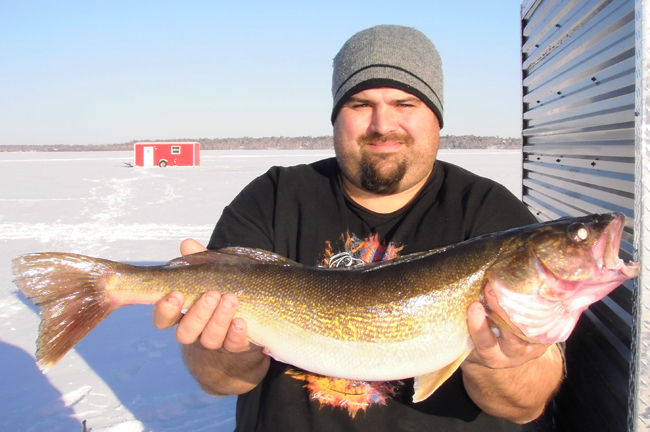 Walleye anglers have been concentrating on the larger lakes because they have the best accesses and the most resorts plowing roads on the ice. 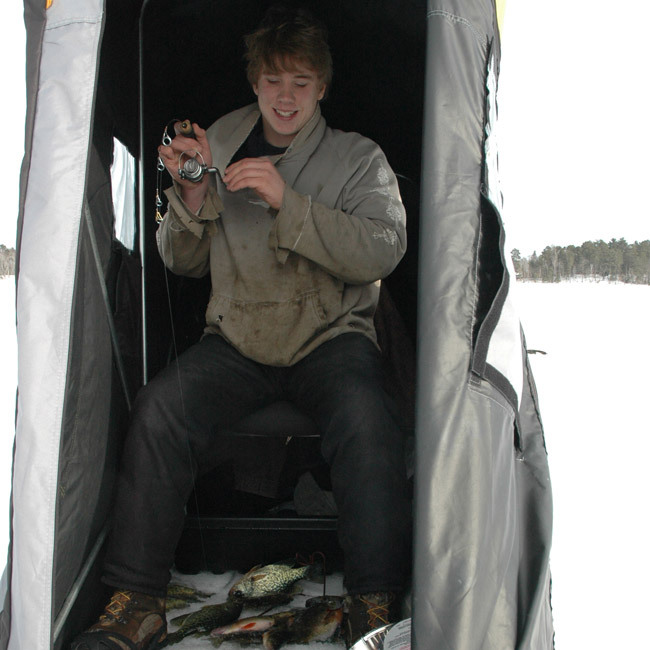 Anglers fishing smaller lakes for panfish have been using snowmobiles or track vehicles. Anglers are advised to travel in pairs and bring a shovel and a tow strap in case someone gets stuck. Anglers can check with the local bait stores to see which lakes have been getting the most fishing pressure. A slow melt this spring could improve the ice conditions and extend the ice fishing season well into March. A fast melt could flood the lakes and end the ice fishing season prematurely. Anglers with stationary fish houses should consider removing their house early this year, just in case the ice conditions deteriorate quickly. Anglers should take advantage of the nice weather while they have the chance and get out on the lakes to do some ice fishing. 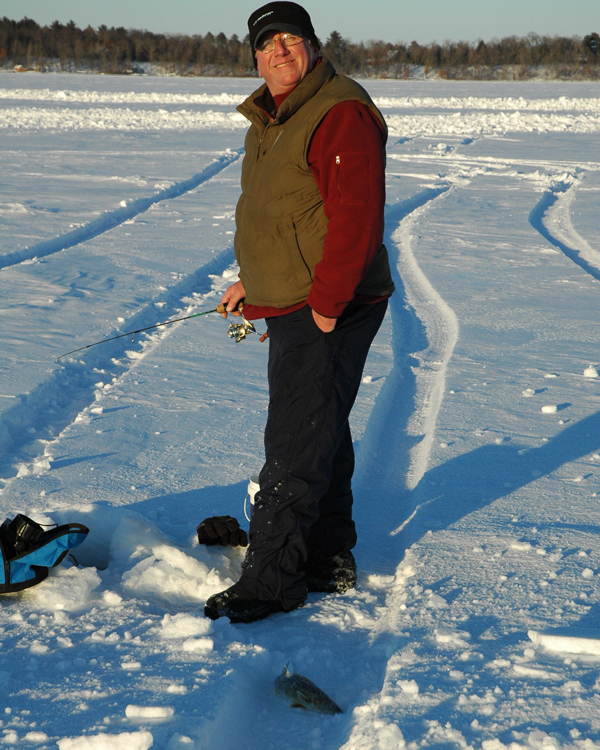 Ice Fishing Report February 9, 2011 Jeff Sundin Spring is coming, but before we get there, we'll still get to enjoy one blast of really good, late-season ice fishing. Travel conditions on small lakes in the Itasca area are improving for anglers who don't mind hoofing it to their fishing spots. For most of the winter, anglers have been forced to rely on plowed roads if they wanted to get out and fish. While that's still the best option for ice fishermen who want to drive onto the lakes, walking conditions are improving for anglers who don't mind hoofing it onto some of the smaller Itasca Area Lakes. There are getting to be a variety of places where snowmobile trails have formed a hardened crust on them and it's turning them into the equivalent of walking trails. Once you're on the lake, snow cover is still fairly heavy, but snow has packed down enough that walking from spot-to-spot is much improved. For panfish anglers, this is good news because lots of the better Sunfish, Crappie and Perch spots have received little, if any pressure this winter. When you get to the fish, they're biting! If you're like me, battling a severe case of coopedupedness, you can kill two birds with one stone. Getting a nice walk and catching a few fish at the same time. Don't let the current blast of cold air discourage you either. Yesterday I noticed that in spite of below zero temps and a stiff, 20 MPH wind, the sunshine was still melting the tops of snowbanks. A couple of more cold blasts and we're looking at spring! (2/9) Lake of the Woods continues to be a "go-to" destination for Walleye anglers in Northern Minnesota. Checking in from Sportman's Lodges, Jacki LaValla says that areas within their operating range on the South Shore of Lake of the Woods currently has 30-34 inches of ice. Slush problems cropped up for a while last week, but that has now frozen back up and no ice has been lost. Snow cover of up to 3 feet remains on the ice, but the main snowmobile trails on the ice, have all been freshly groomed and are in ideal condition. Snowmobilers can travel from Wheeler's Point to Oak Island, Oak Island to Warroad and Wheeler's Point to Baudette. At this point Sportmen's looks forward to ice fishing the South shore until March 31. Sportsmen's Northwest Angle & Oak Island area of Lake of the Woods near Sportsman's Oak Island Lodge has about thirty inches of ice in the areas where they fish and travel. Like the South shore area, slush has re-frozen and is not currently a problem. The main snowmobile trails on the lake and Rainy River that the Snowmobile Club maintains have been freshly groomed and are in ideal condition. Their plowed ice road from Young's Bay to Oak Island is in good shape. 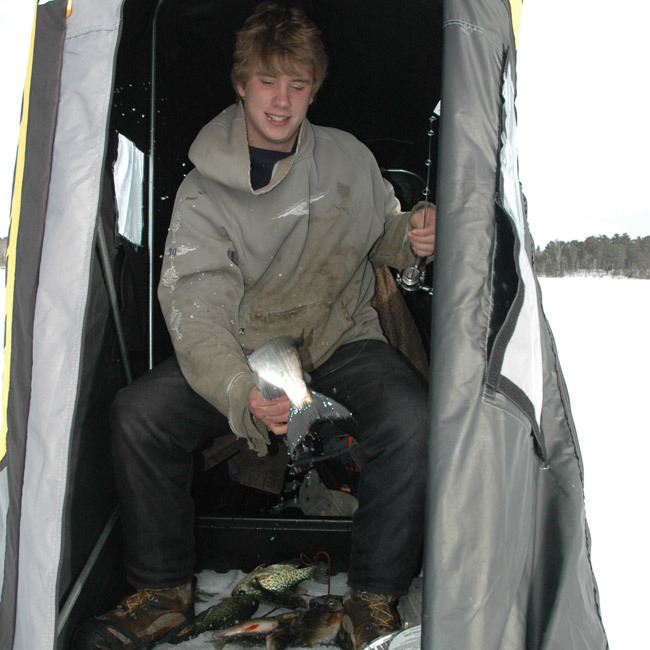 At this point, they are looking forward to ice fishing in the Northwest Angle area until March 19. (2/9) On Lake Winnie, Highbanks Resort. The access is closed to the public for wheel house traffic until further notice. They are allowing public vehicles with portables and snowmobiles with portables to access. Their roads do access the Perch Bar area to the North. Slush on the spurs off of the main roads continues to be a problem. For last minute updates, you can call 800-365-2560. (2/9) Chris Niskanen, well known to many anglers, hunters and outdoor enthusiasts as the editor and outdoors columnist for the St. Paul Pioneer Press, has been named as the new Communications Director for the Minnesota DNR. Niskanen will begin his new job with the DNR on February 22, 2011. (2/8) Aquatic Invasive Species affects all of us. Anglers For Habitat dropped me a line with a heads up that the Minnesota Legislature has received a report on the preventing the spread of AIS. Here's a link to the report Minnesota Legislature, Aquatic Invasive Species Prevention Measures . Ice Fishing Report February 8, 2011 Jeff Sundin Back into the deep freeze for a few days and another small step forward in the battle against poor ice conditions. It's been a slow process, but every time we get one of these low level melt-downs and the subsequent re-freeze, we are gaining back a few fishing locations. Roads that had deteriorated and areas that flooded over during the past weekend will firm back up this week and we'll see another improvement in travel conditions. Good fishing reports from around the area should be encouraging. Panfish action has been good on almost every one of the smaller lakes in the area. Generally, Sunfish and Perch are moving back toward shoreline breaks and weed edges. Crappies are mainly still holding in the deeper holes, but they too are moving closer to the steep shoreline drops where we'd see them in the early fall. (2/8) My friends at Wired2Fish have a ton of video to look at! Who are they? Find out here. (2/8) I talked with my buddy Chad Benson, Chad's Red Lake Rentals about how things are going up on Red Lake for him right now. Like Ryan Klein, he has also moved most of his fish houses back toward the shoreline. Rock piles, breakline corners and points are holding enough fish to make it interesting, but the bite is not fast and furious. At the moment, most of his groups are catching somewhere around 10 Walleyes per outing, some have done better. With the inland lakes Walleye season beginning to wind down, Chad's big news today is that he's beginning to move some of his rental shelters down to Cass Lake. Teaming up with his good friend Ron Miller at Wishbone Resort, they'll be offering lodging and ice shelter rentals throughout the late winter/early spring to cash in on some great Jumbo Perch fishing. Chad has one of his wheel houses moved down there already and he'll have at least one more moved down there before this weekend. The plowed access at Wishbone will be open for lodging and rental shelter guests only, so this promises top be a great, semi-private haven for late season Perch anglers. (2/8) On Lake Winnie, Dixon Lake Resort updated me with their road condition report and the access road is still in good condition all the way from the Third River Road, down to the lake. After the weekend, slush was a problem for anyone who wanted to travel off of the main road, but this cold snap is going to help with that. The fishing report from Third River was good this weekend. Northern Pike appear to be moving again and one group came in with a dozen Pike ranging in size up to 8 pounds. Action for Perch, Crappie and Sunfish is also holding up well. This weekend, there were even a few Walleyes coming in. If you've been reading the reports this winter, you know that these folks have been keeping these roads open even when lots of others are, or have been closed. Do everyone a favor and remember to drop a few bucks in the donation box on your way down to the lake. Ice Fishing Report February 7, 2011 Jeff Sundin Our weather on Sunday took a slight turn back toward winter, but warmer tempertures lingered just long enogh for many of us to enjoy one more pleasant day on the lake. The temps managed to hold in the mid 20 degree range and there was a breeze, but it was manageable. We had planned to do some work with the video camera, but everyone was in more of laid back mood and I guess we were all ready to just turn it into a family day on the ice. My daughter Annalee and her boyfriend, Austin joined me. The three of us met up with Jason and Sara Green, their boys Ryan and Austin and friends Greg Clusiau and Blake Liend. The game plan was to try for panfish and happily, it turned out to be a great day. We knew that driving out to the lake was not an option, so the Greens brought one snomobile and Greg Clusiau brought another. By the time we arrived at the lake, we discovered that there's been enough snowmobile traffic during the past week to pack down a nice walking path. I went ahead and hoofed it on to the lake and as long as I stayed on the old snowmobile trails, the walking was easy. Even on the ice, snow cover has packed down enough this week to allow at least some freedom of movement on foot. We all got srtated setting up and with three augers going, it didn't take too long to get a bunch of holes drilled and spread out along the shoreline. I started in the bay closest to the landing while the others moved further up the shoreline. Our first set of holes were in the 8 to 9 foot range, a little too shallow as only an occasional fish moved into view on the flashers. I moved up the shore and out to about 10 feet deep, the action was slow at our end of the bay, but we were starting to get a few fish. Further up the shore and out a little deeper, Greg and Blake were getting into some fish that were more aggressive. As we continued to move in their direction, the rest of us began getting better action too. On these small, multi-species lakes, it's common for Perch and Sunfish to keep us busy during the daytime and then see Crappie movement pick up toward evening. That's the way it worked today too. Perch were moving in good numbers and ranging in size from tiny, to really nice. By sorting, we were able to get a good number of Perch in the 10 inch range with a few pushing over the 11 inch mark. Sunfish were less abundant, but also present. The majority of the sunfish were in the 8 inch range, but occasionally, someone would hook into a really nice one. Crappies hadn't made their move by the time we left, but Blake did catch at least one to prove that they were there. Fishing from the bottom up to a couple of feet above bottom was the best approach. There were several lures that worked well, but the top producers were Nothland's "Mudbug" and "Glow Bugs" tipped with waxworms. For me, watching the Humminbird for a fish, twitching the bait a few times and then lifting the bait up about a foot was just what they wanted to see. Twitch, lift, pause....strike. By the time we wrapped up, there were plenty of fish for a colossal fish fry and a couple bags to send home with the hungry college students. (2/7) Ryan Klein at Ryan's Red Lake Rentals Wasn't disappointed to see this week come to an end. He said it was one of the toughest bites they've see a while. Last wednesday and Thursday the center bar area where they had been fishing just seemed to shut off. Once they relocated the fleet of ice shelters back to some rock and gravel spots on the shoreline. They were able to get most of the fish houses back up into the 10 fish range for the weekend. Early morning and late efternoon periods are still producing the best Walleye action. "It was a lite bite" Ryan added, and many people were missing as many fish as they were catching. Along with the warm up, came an increase in Northern Pike activity. It's getting more common to hear about one of the customers bagging a pike, including a 40+ incher that came in this weekend. The plan for this week is move more fish houses out to the mud. Typically, there's an increase in activity toward the end of the season and Ryan is hoping to cash in on that for the next few weeks. (2/7) My fishing buddy Matt Mattson, took a trip up to Lake of the Woods this weekend and came home with a good report. Staying at and operating out of Border View Lodge, they jumped into the bomber and headed out to the reefs. Matt said that Sauger action was fantastic out there, they caught 29 Sauger and managed to keep a bunch of them in the 14 to 15 inch range. On the reefs, Walleyes are few and far between. Matt figured that their ratio of Walleye to Sauger was about 1 to 10. The Border View fleet of rental shelters is split between the rerefs and the mud. Out on the mud, Walleye action has been slower, but the average size of fish has been great. If you fish the mud, you'll probably catch a half dozen fish, but they'll generally be nice. Ice Fishing Report February 6, 2011 Jeff Sundin The warm weather has encouraged a partial melt down of snow cover and improved conditions in certain, limited areas, but not everywhere. On Saturday I said that things might get a little sloppy during the warm weather. I didn't realize at the time, that some of the main sloppiness would be underneath my own truck. When we left the house with a game plan of setting some tip-ups to catch Northern Pike, I didn't know exactly where I was heading, but we thought a stop at Ball Club might be a good idea. When we arrived, I was pleasantly surprised to see that there were some other trucks out on the ice and that they seemed to be moving around fairly well. We spotted a friend who has his fish house set up out there and decided to do him a favor by plowing a road out to his shelter. It was actually too good to be true. The ice was nice and solid and it was easy to make the road for him, so far, so good. After we chatted for a while, I got the idea to open up a little fishing territory of my own. This project didn't go quite as smoothly. I managed to open up about 1/10 of a mile stretch of new road before coming to a pocket of deep snow, under that was a patch of slush covered by a layer of thin ice. Do I need to say more? Actually, when you see the pictures, it makes the problem look worse than it really was, but it's a good time to show an example of what's been going on under the snow. There are areas where deep, drifted snow has protected the surface ice from freezing solid. Under these, there is a double layer of ice with a few inches of water trapped between them. What you see here is that my truck broke through the thin surface layer of ice and settled down on the main ice sheet. For me, all I needed was a few munutes of clearing snow with a shovel and I was able to drive out. But it did remind me, that even though ice conditions are improving, we're not out of woods just yet. After I got out of the slush hole, I drove the truck back to where we had started and we finished our fishing trip on foot. I drilled a couple of dozen holes along a block-long stretch of the breakline. Depths ranged from about 12 feet on the shallow side down to about 30 feet at the base of the breakline. Using a combination of tip ups and jigging spooons, fishing was slow until I arrived at a small underwater point in about 28 feet of water. Here there were lots of minnows showing up on the Humminbird and there was a school of modest size, but aggressive Perch. We managed to bag enough of them for a meal using Northland Buckshot Spoons tipped with wax worms or minnow heads. Northern Pike didn't seem too interested in our tip-ups. There were a couple of times that flags went up, but no fish were hooked. On our way back out of the lake, we stopped and compared notes with our friend who was spearing from his darkhouse. He said that he'd seen nine Pike and Bagged two of them, so apparently the fish were present, but not feeding aggresively enough for the tip-ups to work. (2/6) Chester Powell from Fred's Bait, Deer River reported talking with a group of anglers who had just returned from Upper Red Lake on Saturday. Between the four anglers, they bagged 11 keeper size Walleye and released another 27 Walleyes that were either too large (in the slot) or too small. Hey! (2/6) I had high hopes for that spot, but I guess we'll go somewhere else today. We're still working on getting enough footage for our Pike video, so we'll be covering some ground. Have a great day! Ice Fishing Report February 5, 2011 Jeff Sundin Oh man, it seems like a long time since I felt a nice warm breeze on my face, but it finally happened on Friday! It feels really good to be able to walk upright light a human being again instead of hunkered down inside a heavy coat. It almost looked like we were in for trouble when the morning started out with a mixture of freezing rain, snow and sleet. Luckily, the precipitation didn't amount to much and hopefully, the warmer temperatures started to work on melting down a little more of our snow cover. In the short term, I can see that things are going to get sloppy at the landings today, but we need this to happen before things will get better. We do have another cold snap heading our way and with it, the chance for improving ice conditions. I know that a lot of us would love to see a few of those nice, warm March days with the Perch coming in fast and furious. It's never too late. For this weekend though, I'm afraid that a lot of the news is more of the same, everyone is hoping for ice conditions to improve and doing the best they can to work with what we've got. (2/5) Blackduck Lake, Monte Sharbono at White Birch Resortsays fishing on Blackduck lake is still good for Jumbo Perch with many fish in the 12 inch range. Best presentation has been small jigs tipped with minnow heads or wax worms. Perch action has been good during the middle of the day in 16' of water. It's helped that they've kept their roads open all winter and there are no slush problems near their rental shelters. On the rest of Blackduck Lake though, you will need a snowmobile if you plan on moving around. Monte added that they still have some cabins available for this winter and they are able to accomodate large groups. I love it that they include a free ice shelter with their cabin rentals! (2/5) Another Leech Lake Report from Norm at the Shores on Pine Point, ice road conditions remain good and they've just added a new mile long spur to their main road. This one goes from Goose Island out to the Snake Pit. Norm added that all of the other spurs are plowed and open. (2/5) On Upper Red Lake, Ryan Klein at Red Lake Rentals says that they've had to pull up stakes from the Center Bar area. The plan was to move some rental shelters out onto the mud flats, but a combination of heavy snow, slush and thin ice has been flooding everything they try to set up out there. For now, conditions have forced them to head back for the shoreline instead. Fishing on rocky points and shoreline breaks, the Walleye action is slow, but there are fishing being caught by most everyone. Ryan says he's expecting to see catches of 8 to 12 fish per house over the weekend. Ryan mentioned that the upside has been agressive fish. He says that when you see them on your flasher, they usually bite. (2/5) On Bowstring Lake, Darv Oelke at Bowstring Shores Resort. They continue to battle slush problems on Bowstring, but Darv is trying to push some new roads out into deeper water where he hopes Crappie action will improve shortly. Fishing on Bowstring is described as fair, guests are catching some nice Perch, Pike and an occasional Walleye. Best Perch action is coming at 18 to 20 feet of water. (2/5) Acorn Hills Resort on Leech Lake checked in with a quick report. 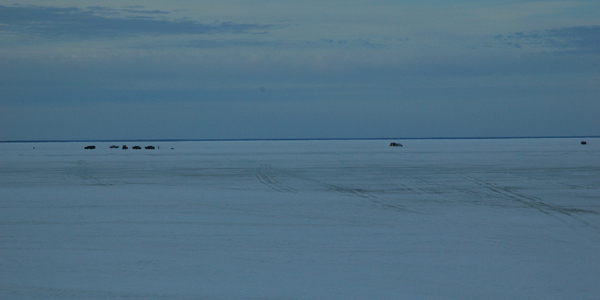 Ice conditions on the west side of Leech Lake have been improving and new roads are being added. Ice Fishing Report February 4, 2011 Jeff Sundin The warm-up has really kicked in over night. At 5:00 AM its already 19 degrees here in Deer River and I see warmer temperatures to the west. Now if we can dodge any major snowfall, we might actually have a busy weekend in the making. Fishing news in the Deer River area hasn't changed much in the past few days, so reading the recent reports will get you up to speed in a hurry. (2/4) Most folks with really big fishing plans for the weekend are heading toward Lake of the Woods where the action has been consistent all week. Some family friends just returned from there and reported having good fishing. They were able to have a fish fry while they were there and everyone in the group returned home with their limit as well. The Walleye action wasn't fast, but it was steady, coming in short spurts periodically. They were 7 miles out from the gap fishing in about 32 feet of water. Mike Kinsella of Border View Lodge sent an update from Lake of the Woods too. Their plowed roads continue to be in excellent condition and the fishing action is steady. They are fishing out about 11 miles from the gap in 32 to 35 feet of water and continue to see and catch lots of suspended Walleye. Make sure you have your Flasher along and watch the screen like a hawk! Even though the ice shelters are located in deep water, many fish are caught 5 to 20 feet below the ice surface. (2/4) On Ball Club Lake, Gus' Place Resort, Gus reports fishing conditions similar to recent reports. The plowed road has improved recently though and they now have good access with a slush-free, plowed road out from the resort to the main drop-off. The ice thickness ranges from 24 to 18 inches and the ice remains snow covered with about 10 inches of snow depth. Travel off of the plowed road is possible with thire chains. Gus adds that without chains, you will get stuck! Female Perch are starting getting heavy now as spawn develops and with warmer weather on its way, they are anticipating the start of some late season panfish action. Crappies and Sunfish are due to start moving at almost any time now. Remember, Gus always shares GPS coordinates with his lodging customers! (2/4) On Lake Winnie, Highbanks Resort Has their road system open for light vehicles and anglers with portable shelters. For now, if you have a wheelhouse, you're gonna have to find a different spot. Slush continues to plague the spurs off of the main road and until we get an improvement in conditions, the big houses just can't get around out there. The roads out of Denny's Resort are also scheduled to re-open today as well. With all of the roads closed, fishing reports have been scarce from Winnie this week, but the bright spot has been Perch and Panfish action up in the Northwest corner. For now, the road coming into the Third River area is still in good condition, with the warmer temperatures this weekend, we're likely to see some slush pockets and wet spots cropping up. Ice Fishing Report February 3, 2011 Jeff Sundin Wednesday was another treat for the eyes up here in God's Country. A little brisk with the wind blowing, but not not a cloud anywhere in the clear blue sky. I and Jason Green managed to sneak out in the afternoon and had a look around out on Lake Winnie and I have to say, it's been a long time since it looked this empty. We saw two men coming off of the lake on snowmobiles, but with many of the resorts and rental operators temporarily closing their roads, vehicle traffic was virtually non-existent. Don't worry though, this will change after today as some of these roads open back up for the weekend. In fact, Highbanks Resort will re-open their road system at 7:00 AM this morning. The roads out of Denny's Resort will remain closed today, but are scheduled to re-open tomorrow (2/4) morning. We didn't do any fishing yesterday, instead we spent some time looking around, figuring out where we want to try this weekend when we bring all of the kids out. While we were at it, we got some pictures and did a little more video work. Hey! (2/3) The next video is coming soon. We've been chipping away at the footage for our Northern Pike piece and with a nice, warm weekend precdicted, it looks like we might be able to wrap it up really soon. For today, they're predicting 22 degrees above, so if I can find my shorts, I might have my own afternoon on the ice. (2/3) Bemidji Lakes Area February 3, 2011 NMLOG Member, Paul A. Nelson in his own words; "February is here and the days are slowly getting longer. The Bemidji area is picking up about 20 minutes of daylight per week during February, so temperatures should slowly be getting warmer too. Lakes in the Bemidji area are still covered with heavy snow. 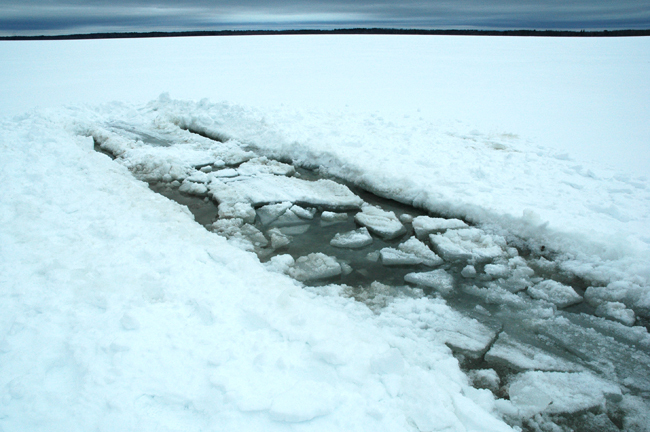 Most lakes have patches of slush under the snow, so most anglers are sticking to the plowed roads on the larger lakes. Anglers with snowmobiles have been able to maneuver around the lakes, but the snow is deep enough to get a snowmobile stuck too. Anglers should travel in pairs and bring a shovel and tow rope just in case someone gets stuck. Fishing has been best on the warmer days, when the snow begins to melt on the lakes. Walleyes have been biting on jigging spoons tipped with a minnow head or on dead stick rods with a bobber and a lively minnow. The best depths for Walleyes in most lakes have been 16-24 feet of water in both the mornings and evenings. Perch anglers have been catching fish on the edges of structure in 20-30 feet of water. Anglers have been using small jigs tipped with wax worms or several eurolarve fished on light rods with light line. Dropper rigs are another good way to catch finicky perch, while small plastics work great when the perch are actively feeding. Crappies have been biting in 25-40 feet of water on most lakes, with crappies suspending 5-15 feet off of the bottom. Anglers can use plastics, small minnows or a variety of smaller jigging lures for crappies. Whitefish and tulibees have been biting in 30-45 feet of water in many of the larger lakes. Whitefish tend to stay close to the bottom, while tulibees often suspend much higher in the water column. Anglers can catch both species on small jigs with wax worms or eurolarve. 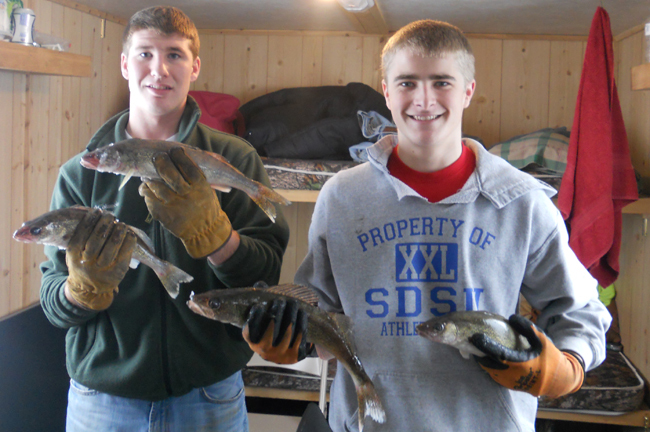 Eelpout should be getting more active as they get ready to spawn under the ice in March." (2/3) On Lake Vermillion, Ed Tausk of Vermilion Dam Lodge forwarded and email report from snowmobilers staying at the lodge located on the Cook, MN side of the lake. They are reporting good travel conditions on the snowmobile trails and on the plowed "ice roads", but added that slush problems off of the main trails persist. Travel off of the main roads is not recommended. (2/3) On the Tower Side of Vermillion, Jay and June Schelde of Pike Bay Lodge are reporting that plowed roads on the east end of Vermillion are open and accessible from public landings. Jay says that the plowed roads will currently get anglers to any one of four good fishing areas. With 24 inches or more of good ice, there are still some slushy areas under deep snow, but it hasn't been a major problem. Snowmobile trails are well packed and frozen. Walleye fishing has been better, they're still catching some fish, but its been "streaky". Perch action has picked up though and that would be a better target species for the up-coming weekend. Jay reports that there have been lots of nice Perch including many JUMBOS in the 12 inch range. Ice Fishing Report February 2, 2011 Jeff Sundin Tuesday was a stormy day for lots of folks accross the midwest. Lots of snow, wind, freezing rain and otherwise yucky weather. I almost felt guilty for enjoying a bright sunshine filled day up here, but not quite. Sorry folks, we already had a month of that kind of weather and many of us needed some sunshine to save us from slipping into some sort of syndrome. Along with the sunshine came another episode of frosty temperatures, but during mid-day, the strength of the sunshine really kicked in and it felt downright nice outside. I was feeling lucky, so I went outside after lunch and played in the snow for a while myself. Hoping that I could follow up on the panfish report that I'd gotten from Bob Mohrman, I parked my truck on the road and attempted to walk into Little Cutfoot. I really hate to be saying this, but hoofing it just isn't going to work right now. I did manage to walk in 100 yards or so, but I never got close to the ice, let alone getting to a good fishing spot. Until we get a warm spell and subsequent meltdown, snowmobiles and plowed roads are the only way we're going to be able to fish. Ironically, the more people I talk to, the more good fishing reports I hear. 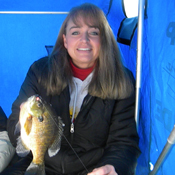 Almost all of the popular late winter panfish spots are producing panfish and the crowds are practically non-existent. Since I'm "snowmobile challenged", my next move is to line up some friends with machines and go hit the lakes with them. (2/2) Following up on a question about Ice access on the West Side of Lake Winnie, I talked with Craig Brown at McArdles Resort. He told me that the plowed road that they share with Becker's Resort is still in useable condition, at least as far out as the shoreline of Sugar Bay, but for now, that's as far as it goes. During last weeks severe cold snap, a small, but very wet crack opened up and caused major flooding. The flooding blocked off access to Sugar Bar, Center Bar and other deep-water locations. On Tuesday, he was hopeful that the current cold snap would re-freeze the sections of road that were flooded. In order for the re-freeze to work, they're depending on anglers to use good judgement and refrain from crossing the wet areas until the ice is solid again. The fishing report on the West side of Winnie has been good for anglers who want Perch and Northern Pike. The shallow water breakline from Sugar Bay back toward the mouth of the Mississippi have been good. Before they lost access to deeper water, Walleyes were hitting well out on Sugar Bar and Center Bar. Ice Fishing Report February 1, 2011 Jeff Sundin Okay now don't laugh, I know it's 15 degrees below zero right now, but I'm an optimist and I say welcome to the home stretch! We might have a few more wintery episodes ahead, but February is a short month and we are picking up roughly 4 minutes of daylight every day. Do the math, by March 1st, we'll have 2-1/2 more hours of daylight than we had just 31 days ago! 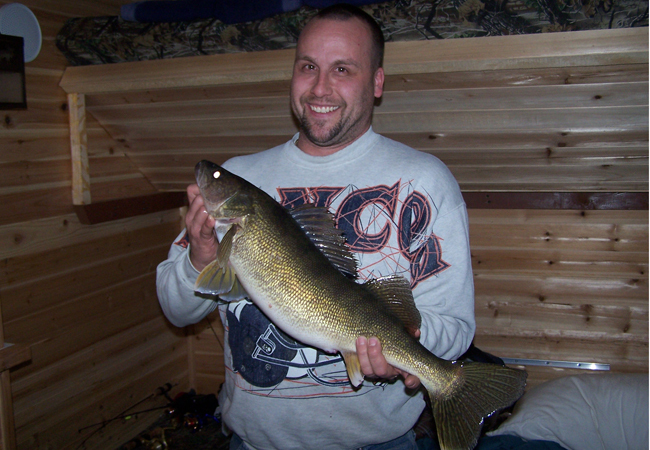 We are now only about 60 days from the spring Walleye fishing on the Rainy River and it's only 102 days until the 2011 statewide Walleye fishing opener. Note: I've had some folks asking about updates for Big Sandy Lake in McGregor. I don't get to see this lake too often and I've had trouble getting a report from down there. If you're near Big Sandy, I'd appreciate a little help from over in that area. Everyone! Join me in welcoming Bob and Ruth Mohrman back home to the Cutfoot Sioux Inn. After selling the resort several years ago, they've come back again and are currently making preparations for the up-coming 2011 fishing season. I think that lots of folks will be happy to hear that they're back, so help spread the word and lets see if we can get a few of "the regulars" back over there. By the way, Cutfoot Sioux Inn does have winter lodging, so if you're heading up to ice fish, give them a shout. (2/1) Checking in with a fishing report from Cutfoot and Little Cutfoot Sioux, Bob says that if you have a snowmobile, it's worth the trip out for Sunfish and Crappies. Panfish have started their late winter movement toward the shallow weedline. Sunfish are as shallow as 8 feet right now and Crappies are located out just a bit deeper in the 11 to 13 foot range. For multi-species action, small jigs like the Northland Mud Bug tipped with a Waxi or other small grub will do the trick. There are also a handful of Perch on the shallower edges, if you start catching them, try switching to a jigging spoon tipped with a minnow head. (2/1) Today, welcome also my friends at Wired2Fish.com! They are all about having fun in the outdoors. They cover fishing, pro anglers, tackle, manufacturers, and anything else fishing related that they come across. They'll be dropping by often with timely updates to supply anglers and fans with the most up-to-date and detailed information about the sport of fishing that they can find. Exhausting every resource they have to get you closer to the pros, the sport, the tackle and more, when you can't be on the water yourself. Today, check out the 16 pound Bass and "The Buzz That Won't Go Away". For newsletters, fishing updates and specials, sign up today! When Chad Beson gets going, it looks like he wants to clear the entire lake! Here he's making a road on Cass Lake near Wishbone Resort. Enjoying a nice afternoon, Arne Danielson picks up a keeper Walleye on our test run of some new territory on Cass Lake. Click to enlarge. In spite of sub-zero temps, sunshine is melting surface snow and improving travel conditions on the lakes. Sara Green with a slab Bluegill. Northland's Mud Bug tipped with a waxworm was a killer combination. Snowmobile trails are hard packed and now provide walk in access into some small lakes. Perch ranged in size, but by sorting, we were able to capture lots of fish in the 10 inch range. Sunfish were mixed in with the Perch. Small jigs like the Mudbug tipped with waxworms worked for both. You can see where the truck broke through the thin surface layer of ice and settled down on the main ice sheet. Not deadly, but definitely inconvenient. Warm weather makes it easier to to stay on the ice. On Saturday, we managed nicely without shelters. Courtesy of Chad Benson. Last minute Walleye from Chad's Rentals on Cass Lake (caught on the last weekend of the Walleye season. Photo of Kenzie Benson with a nice Cass lake Jumbo Perch. Courtesy of Chad Benson. Photo courtesy of Jay Schelde, Pike Bay Lodge, Lake Vermillion. Known by everyone as an avid angler, Riley Bisek shows off a Lake Vermillion magnum Perch. Photo Courtesy of Chris Dunker, Big Wolf Resort. Ya gotta click to enlarge this one! Chris's houses must be comfortable! Bill's fishing partner slept right through this event! Photo Coutesy Ryan Klein. Keeper size Walleyes are coming in steady in the Center Bar area of Red Lake. Photo Courtesy of Ryan Klein. Nice, keeper size Walleyes coming from the Center Bar area of Red Lake. Fred's Bait, Chester Powell reported on his Lake Trout Trip. For the full report, click here. Photo courtesy of Chris Dunker, Big Wolf Resort. Nice, mid-size Pike are moving well right now in about 11 feet of water. 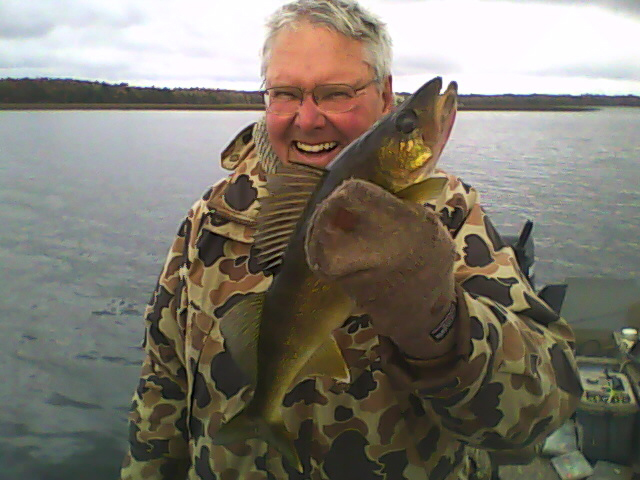 Walleyes on the South end of Lake Winnie are still hitting. You just have to get to 'em! 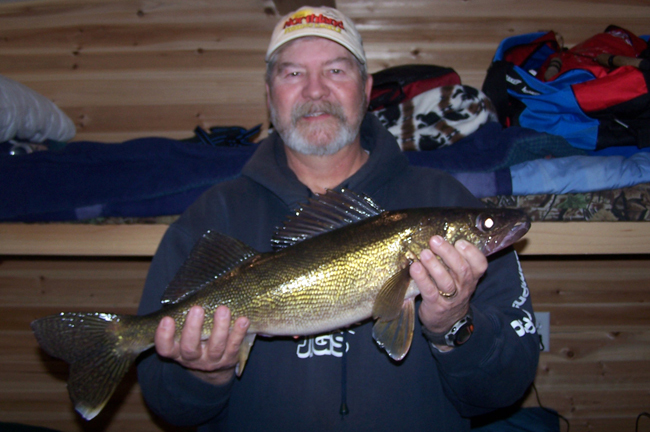 Arnie Nichols with another Lake Winnie Ice Walleye. It's odd to see an ordinarily popular landing sitting idle, but deep snow has kept vehicle away from many popular spots. Walking is an option, but not many anglers have tried it lately. There have been a few anglers walking out from this landing, but there are a lot of un-bothered fish nearby. See us in action! Click image to view the Red Lake Walleye Video. A GPS with a mapping chip is a great way to remember structure that occurs within walking distance of the plowed roads. Humminbird's ICE-55/385ci Combo gives you the map and flasher all in one unit! Courtesy of Chad Brandt. 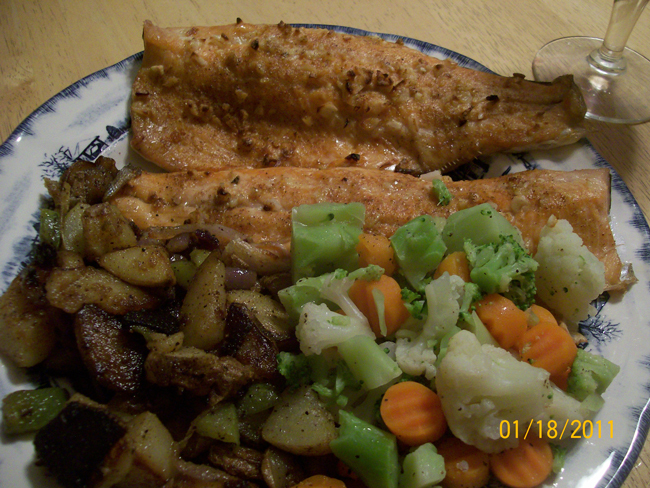 Trout fishing opener paid off with fresh Trout for dinner. Get the simple recipe here. Always wanted to smoke a batch of fresh Tulibees? Watch the video and learn how. A nice Red Lake "eater Walleye" for fishing guide, Jeff Sundin. 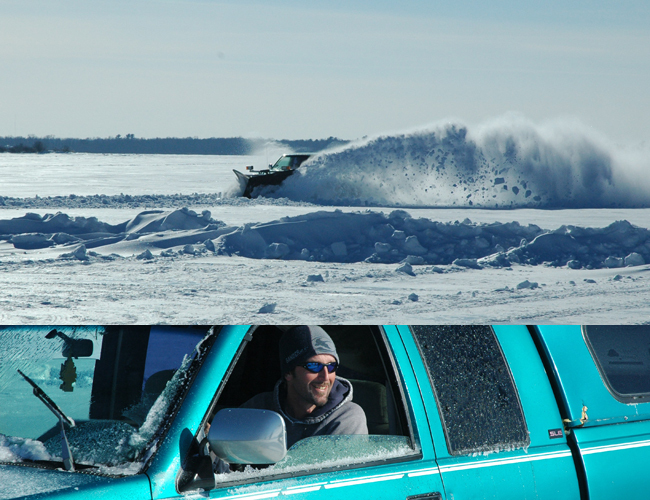 Snow conditions have made for a tough winter, but rental operators like Chad's Red Lake Rentals have done a great job of building roads on the lake. Walleyes came in one by one, but soon there was enough for a fish fry. Tulibees provided fishing action and while were at it, we got a video too. click here to view the Tulibee Fishing Video. Do You Know that you can even post your own helpful hints to my fishing reports page on facebook? YES! You Can! You don't have to tell us your secrets, just go ahead and brag a little when you get a whopper! >>> Click Here >>> Fishing Reports Minnesota . And ... did you know that the Thursday Morning Program is available for a week after the air date? Yes, if you miss the live show, just click here and select the 6:00 hour on Thursday. Scroll in to about 6:20 AM and you're back in business! Jeff Sundin is a full time, professional fishing guide, outdoor writer and photographer. Book Jeff for guided fishing trips, for fishing seminars, fishing promotions and media events. Click here >> learn more about Jeff Sundin.